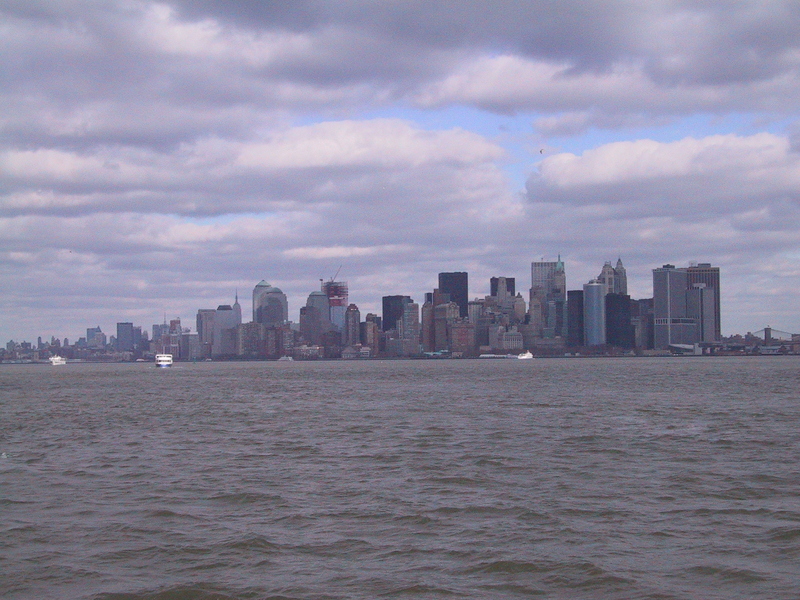 Actually, Manhattan; except for the cruise I took around the island, I never did get off the island. But even given the amount of time I had—three and a half days—there was more than I could possibly see right there in Manhattan. I was surprised to learn how physically small Manhattan is. At thirteen miles long and two miles wide, you could easily walk the length of it in a day. And at times, it felt like I did; people in Manhattan do a great deal of walking, it seems. 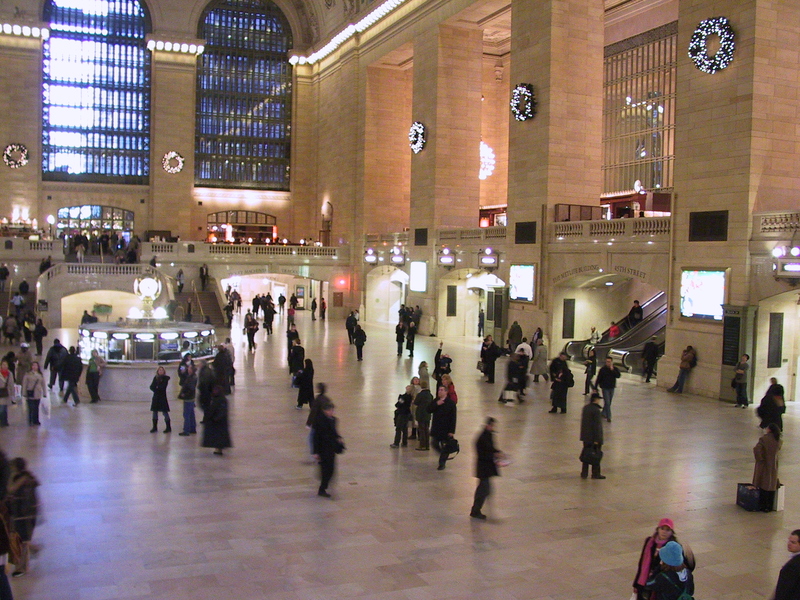 New York City has two major train stations. 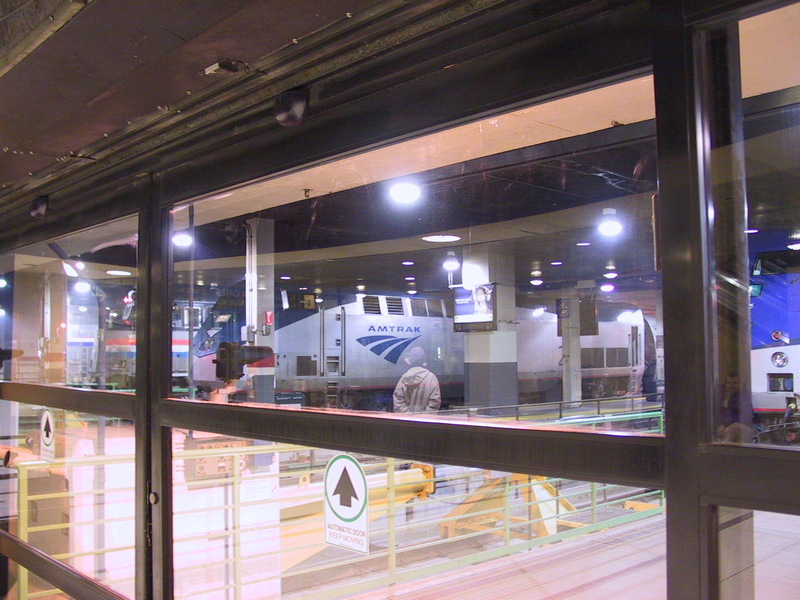 Amtrak trains run in and out of Penn Station, so that was where I first set foot in New York. 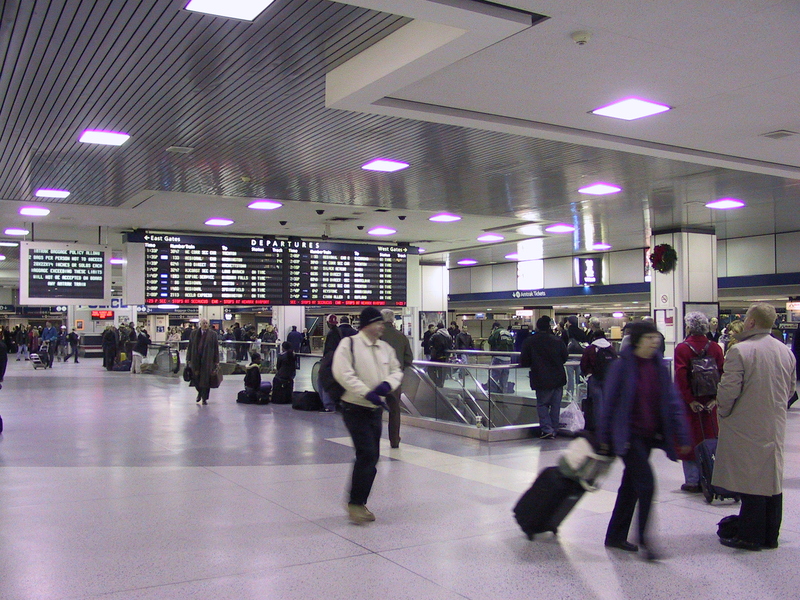 Penn Station is a bright, modern, bustling place. 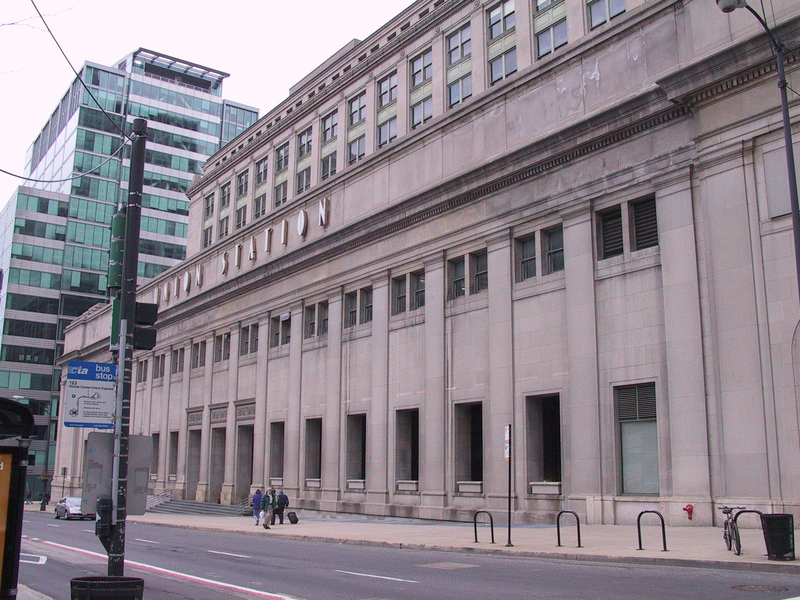 A great many trains run through this station, transporting large numbers of people to Washington D.C., Boston, Philadelphia, and Baltimore, in addition to those of us arriving from more distant places. In addition to the many people scurrying in all different directions, I was surprised to see that Penn Station has a great many shops, some quite upscale. Deep below the station runs the subway, making it simple to transfer from one type of train to the other. Not yet confident in my ability to navigate New York’s subway system, I opted to take a cab to my hotel. This involved standing in a fairly long line, which of course moved rather quickly, given the number of taxis in New York City. Once I reached the head of the line, I was whisked into a taxi by the steward, and we were off. Both my neighbor, Bill, and my guide book (Frommer’s; it turned out to be extremely useful, and I highly recommend it) noted that in Manhattan you often specify an address not by its number but by giving the street and the two surrounding cross streets. My hotel, for instance, was on E 14th, between 2nd and 3rd avenues. Given the rather logical way that most of Manhattan is laid out, this turns out to be an extremely practical way to locate your destination. Except for the lower portion of the island (around and including the financial district), streets are numbered and run east-west, while avenues are numbered and run north-south. Once you get the hang of it, finding any location and determining how to get there becomes a very simple process. The buildings do have addresses, of course, but often the tough part is getting to the right block, and this system does that quite well. The hotel I stayed in—the Union Square Inn—is located very near Union Square Park. While not terribly near most of the major tourist destinations, it is a quiet, relatively nice area in which to stay. The park itself is ringed by numerous restaurants and shops, making it a great “home base.” And beneath the park is a major intersection of subway lines, so that getting to anywhere on in Manhattan (or in any of the outer boroughs, for that matter) is a simple enough thing to do. My hotel was only three short blocks from the park itself, and although I chose to walk it most days even that short walk wasn’t strictly necessary since a subway line runs beneath 14th street and there is a stop right outside the door to the hotel. As you’ll quickly discover when arranging a trip to Manhattan, staying on the island itself can be an extremely expensive proposition. This time of year, anyway, hotels that you might otherwise think would be reasonable—a Quality Inn, for instance, or a Day’s Inn—can run many hundreds of dollars per night. 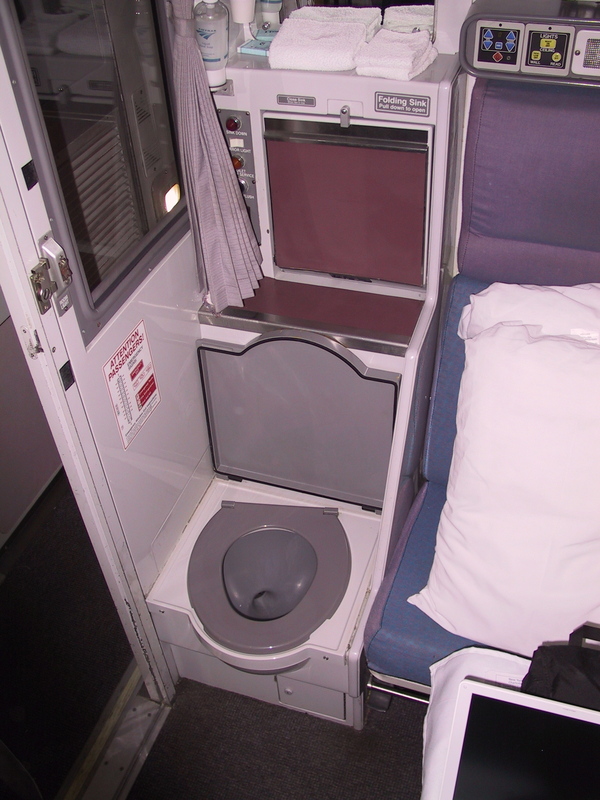 Given that I was in Manhattan for four nights, I searched high and low for a reasonably-priced hotel that was in a good neighborhood on the island and that had a private bathroom (many of the cheaper hotels don’t have private baths). You’ll find that there are very few choices: the Union Square Inn is one of them. If you elect to stay there, rest assured that it is in a good area, it is clean, and, as I’ve already noted, it is cheap. What it is not, is large. This is a very small hotel, in every respect. Not a lot of rooms, not a large building, and most importantly, the rooms themselves can be quite small. I suspect that the fact that I was traveling as a single had a lot to do with the fact that the room I received was possibly the smallest hotel room anywhere. 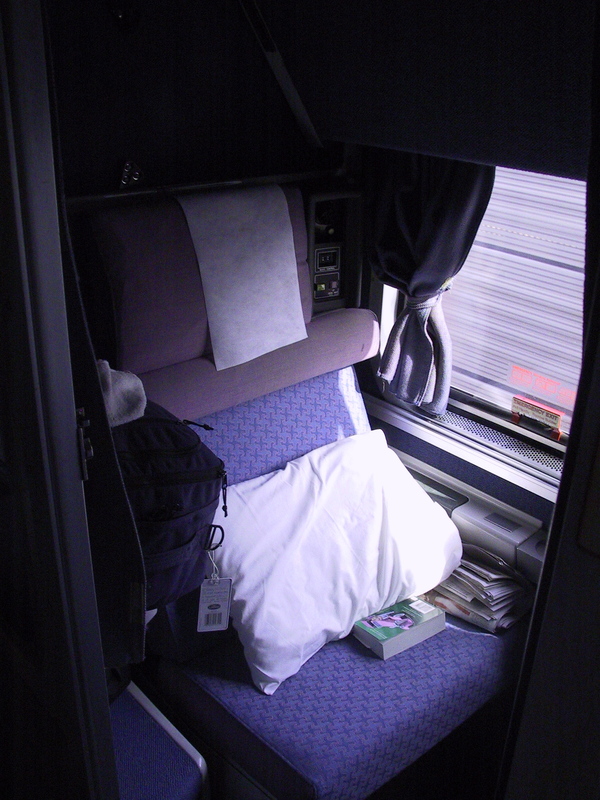 The room itself contained a double bed, a small chair beside the bed that served as an end table (the phone was on the chair and occupied most of the seat; there was no clock), and a tall, narrow cabinet that contained the TV above and served as closet below (the closet portion was about three feet high and maybe two feet wide). There was no closet other than the cabinet below the TV. No dresser, table, or any other furniture. And the floor space around the bed was just enough to walk around two sides (the bed was pushed into a corner); the room was perhaps two feet wider and three feet longer than the bed itself. The one saving grace was the bathroom; it was a normal-sized bathroom, nicely tiled throughout, with a good-sized shower stall. From what I could tell, the hotel did have other rooms that were larger, so perhaps my room was an anomaly. But I should also note that the phone didn’t work very well (I was never able to get an outside line, so I was never able to access the Internet from my room), the hallways in the hotel were extremely narrow, and there was no elevator: only a steep, narrow staircase. Fortunately, my room was on the second floor, so I only had to navigate one set of those stairs. The one small window my room had was partially broken and wouldn’t open. And there was no temperature control of any kind. Fortunately, the temperature in the room always remained within a comfortable zone; important when the outside temperatures were dropping into the 20’s! After the large, comfortable room I had at the Doubletree Club in Orlando, this one was a letdown, to say the least. It set the initial tone for my visit to New York, making me somewhat nervous. I seriously considered switching to a different hotel, but the cheapskate in me won out: just about any other hotel in the city for those four nights would have cost me a small fortune, and as I had already checked in I was probably stuck paying for the first night. I decided to give it the night and see how things went, and I’m glad I did. While things at the hotel didn’t get markedly better, they didn’t get any worse. The room was properly cleaned every day, the bed was fine, and I ended up spending little time there anyway. The one downside: normally I don’t worry too much about hotel security, but this one gave me pause. Because of that, I decided that I should take everything of value with me, every day in New York. This meant that I hauled my backpack, containing my laptop, my camera, my train tickets, etc. with me everywhere I went. I thought about this a lot: I had a hard time deciding if my stuff would be safer in that room, or with me as I rode the subways of New York. But since I already had to take my laptop with me to the local Starbucks in order to check email and post my article, I went ahead and kept it all with me. I did, however, unload everything that wasn’t of value to save weight. My backpack was still heavy, but not nearly as heavy as it could have been. Once settled into my hotel, I decided to check out the immediate area. Ever since I had arrived it had been drizzling, so I donned my overcoat and headed outside. My first stop was the subway station in front of the hotel. I wasn’t ready to go anywhere on it yet, but I wanted to purchase a subway pass so I’d be ready. Even though I was only to be in New York for about four days, it made the most sense for me to purchase a 7-day Metro Card. This is a pass that allows you unlimited access to the subway and to the public bus system for seven days. At $21, this turned out to be a great deal. I ended up making heavy use of it. The “MTA New York City Subway” (the official name for it) is an engineering marvel. Looking at the subway map I received along with my Metro Card, I was amazed and pleased to see how comprehensive the system is. 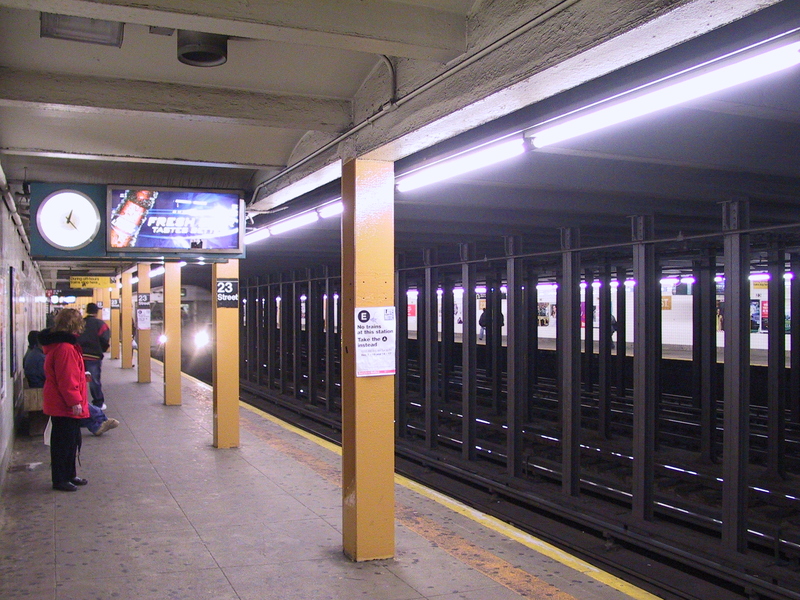 Almost everywhere in Manhattan is within a few blocks of the subway, and those few places that aren’t are served by the bus system, which accepts the Metro Card. 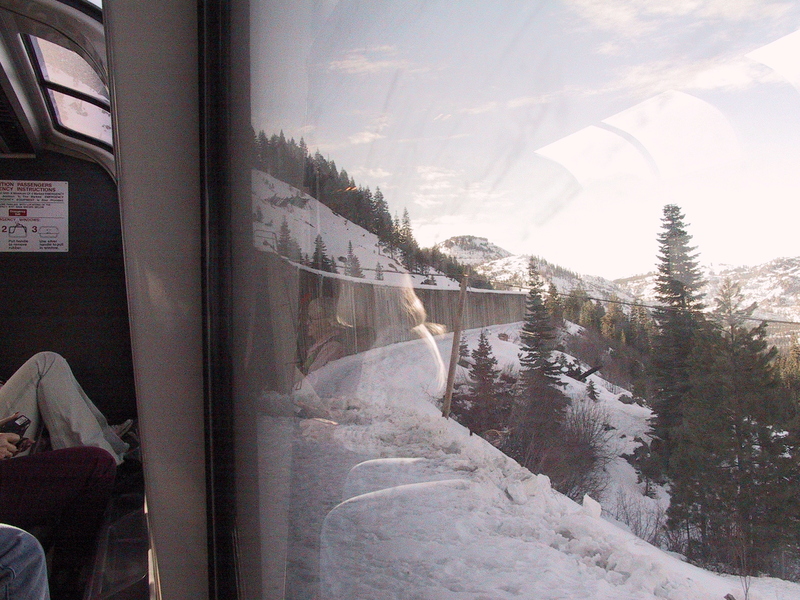 Once you get the hang of the system—learning to read the map, learning the difference between a local and an express, figuring out how to transfer between trains at a given station—you gain confidence and find yourself using it to go everywhere. And the trains run frequently enough that there is no need for a schedule. This system is efficient, cheap, and cleaner than I expected. As long as you use some common sense—wait for your train where you can be seen by the ticket seller, avoid the system late at night—it seems quite safe. I never saw any evidence of any problems. I did see transit police from time-to-time, but they seemed pretty bored. Getting back to Union Square Park: Manhattan has a number of these parks, which occupy one or more city blocks. Union Square Park squeezes between Park Avenue and Broadway (one of the exceptions to the street numbering system, Broadway travels the length of the island, running diagonally in some spots). The park is three blocks long, extending from E. 14th up to E. 17th. When the weather is better, it is the site of a farmer’s market. 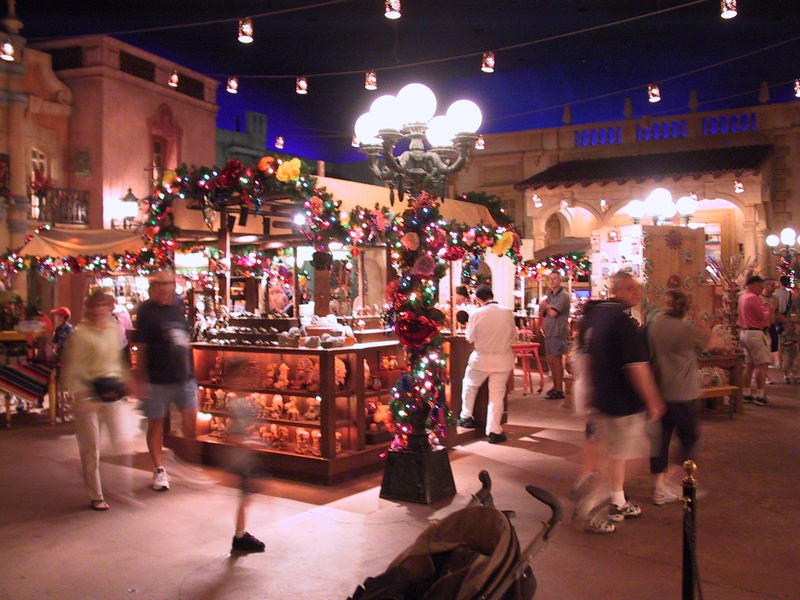 This time of year, it plays host to a number of stalls selling holiday goods. Otherwise, it is mostly grass, criss-crossed with cement walkways. 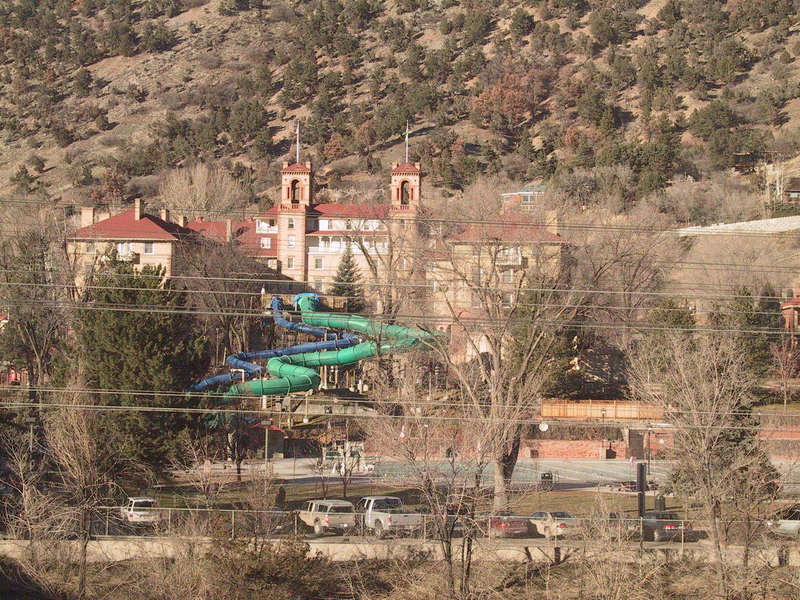 Tall buildings surround the park and loom over it. A giant Virgin Megastore occupies the entire length of the block on the park’s south side. On the east side are a number of smaller shops: a Starbucks, a UPS store, a drugstore, and the like. The west side contains another Starbucks, a McDonald’s, a Heartland Brewery pub, a couple of upscale restaurants, and one of NYU’s dormitories. Feeling a bit out of place, I almost cried when I saw a Barnes and Noble on the north side; it was like an old, familiar friend. Needless to say, that was the first place I went into. Unlike any Barnes and Noble I had ever been into before, this one is tall and narrow. Four stories tall, in fact. It was the perfect blend of New York and the familiar, and it instantly made me feel much better. As I was running low on reading material, I took the opportunity to explore the store and pick up a paperback. 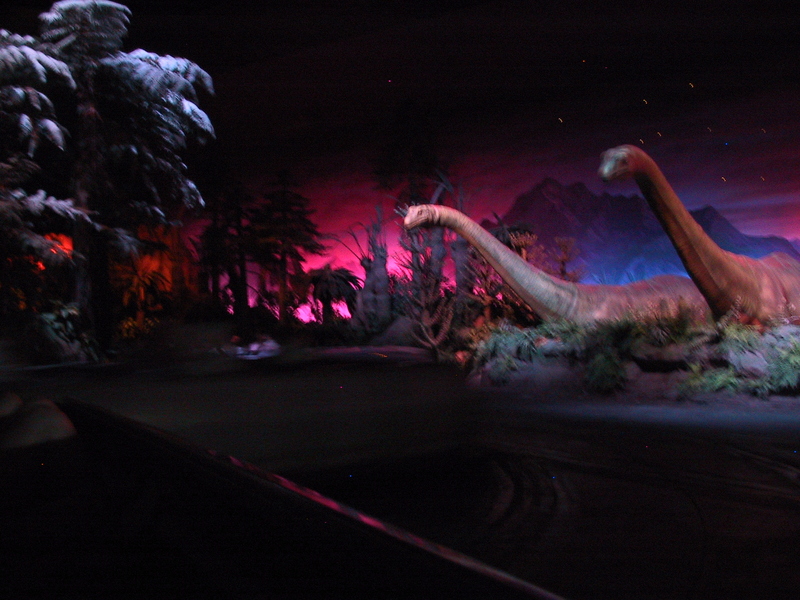 Once outside again, I resumed my tour of the businesses surrounding the park. The Starbucks, I was pleased to note, was a T-Mobile hot spot, meaning that I could wirelessly connect to the Internet from within. Because I could not get to the Internet from my room (my hotel did provide Internet access, I should point out, but you have to use on of the two computers they provided in the lobby; this didn’t work for my purposes), my daily routine involved a morning trip to Starbucks where I could both get something to eat and check my email. Not being a coffee drinker, it seemed a little weird at first, but they do offer hot chocolate and juice, as well as muffins and banana bread and such, so I learned to blend in just fine. That was it for the first afternoon and evening. The next morning, after a good night’s sleep and a nice hot shower, I set out to see the town. I hadn’t really gotten organized, however, so I didn’t have nearly as productive a day as I should have. Once I realized how much I needed to get organized, however, I sat down and made a list of destinations and then organized them by location. No longer did I find myself criss-crossing all over Manhattan. 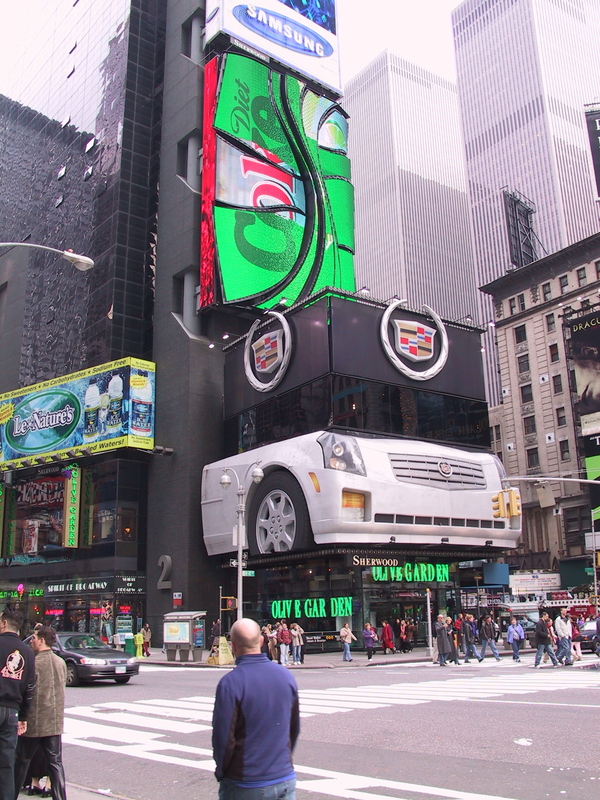 One of the first places I went to was Times Square. What a zoo! It must be one of the top one or two tourist destinations in New York: it seemed like the entire city was out on the sidewalks when I came up from the subway station. Trying to navigate the blocks immediately around the intersection of 42nd street and Broadway (the epicenter of Times Square; this is where the biggest of the big neon signs are to be found) was pretty difficult. I found myself constantly having to fight my way through the crowds. As you probably know—and as you can see from my pictures this place has taken advertising to a new level. Each company is trying to one-up the others, with the result being a total assault on your senses. Its worth seeing, once, but then unless you have a reason to be there (for a show, perhaps), avoid it like the plague. 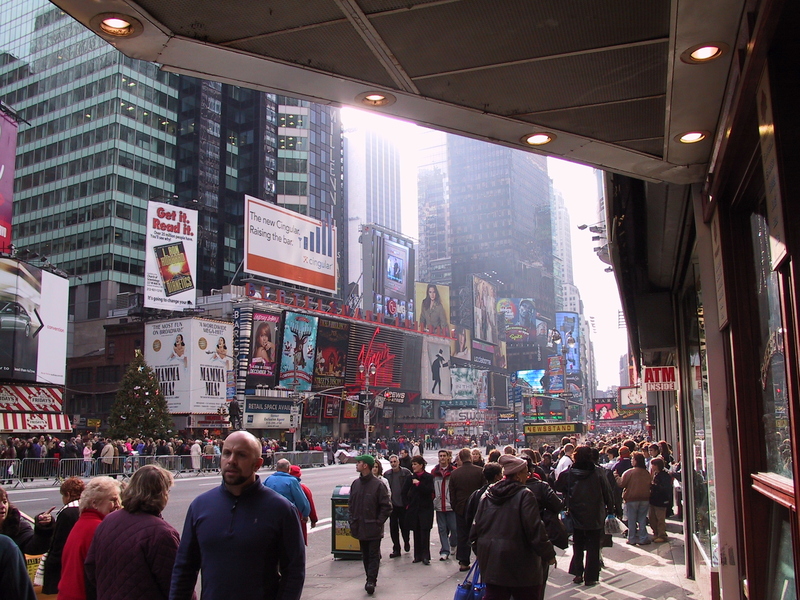 Times Square was the worst, but everywhere I went there were people. Lots and lots of people. 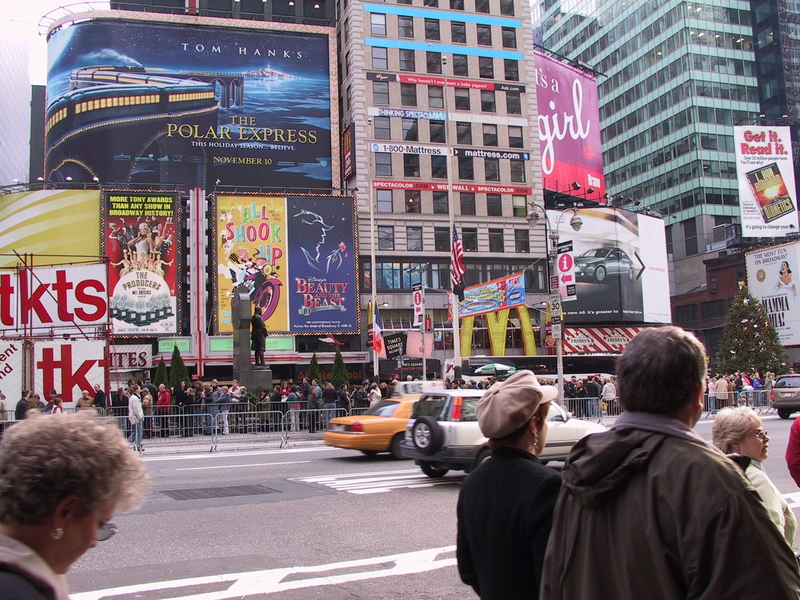 New Yorkers walk a lot, for good reason. Either your destination is only a few blocks away, in which case you walk, or it is farther, in which case you take the subway—which means you walk to the subway, and walk from the subway to your final destination. Some destinations—particularly at night—require the use of a taxi or a bus, but the traffic is so bad here that it is usually easier—and always cheaper—to get where you are going by some other means. There were actually more private cars that I had expected, but driving and parking are so difficult that I’m sure that most people in Manhattan don’t bother. The taxi ride I had taken from Penn Station to my hotel was an interesting introduction to driving in New York: people here seem to use traffic laws as basic guidelines, not strict rules. Pedestrians are just as bad, if not worse: walk/don’t walk signals are almost universally ignored. People cross the street pretty much whenever they can, irregardless of any traffic lights. The one trip on the bus I took was also an eye opener: I really thought the bus driver was going to hit this one car, who was driving in a manner that seemed designed to aggravate our bus driver. And the traffic was so heavy that I could have walked the distance in less time. Me, I would never drive in Manhattan. So where do you get away from all of the people? Where can you find a bit of peace in this urban zoo? Why, Central Park, of course. Central Park is a truly amazing place. It is huge, and absolutely beautiful. I can see where at times of the year it might be a dark and forbidding place; there are whole forests here. But this time of year, during the day with the sun shining through the bare branches of all those trees, it is truly breathtaking. Trees, lakes, meadows, pools, ice rinks, even a museum or two. It is so large that although there are plenty of people strolling through the park at any given time, you still have plenty of space for yourself. And the few streets that go through the park are constructed so that they are isolated from it, helping to keep the park quiet and peaceful. 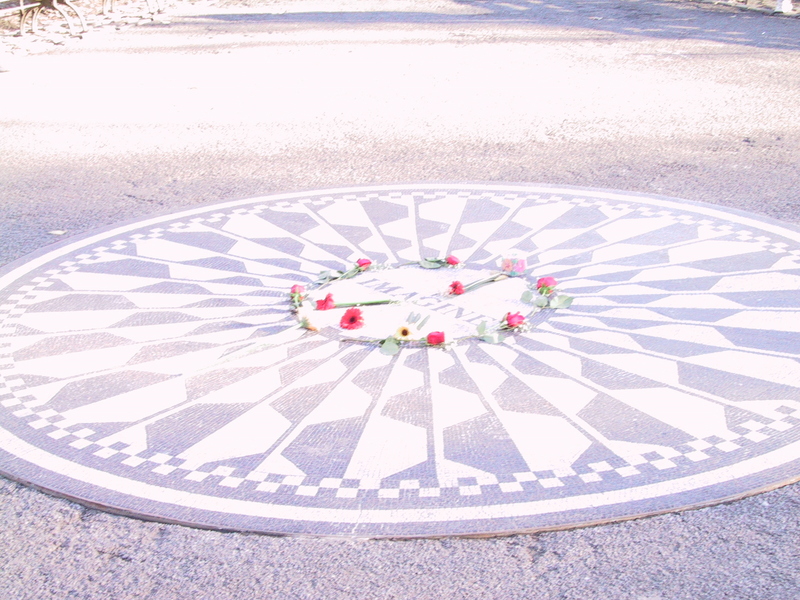 I walked the width of Central Park and through a good part of its length, and felt very safe and comfortable. Central Park truly is an oasis in a sea of humanity. If you find that you need a break from the city, do yourself a favor and spend a little time in Central Park. Once I had gotten myself organized, Central Park was one of my destinations along with the nearby American Museum of Natural History, the Rose Planetarium, the Dakota, and the Wollman Rink. The American Museum of Natural History is one of New York’s most acclaimed museums, as it should be. If you like dinosaurs, anthropology, and the like, do yourself a favor and take a look at this, one of America’s great natural history museums. 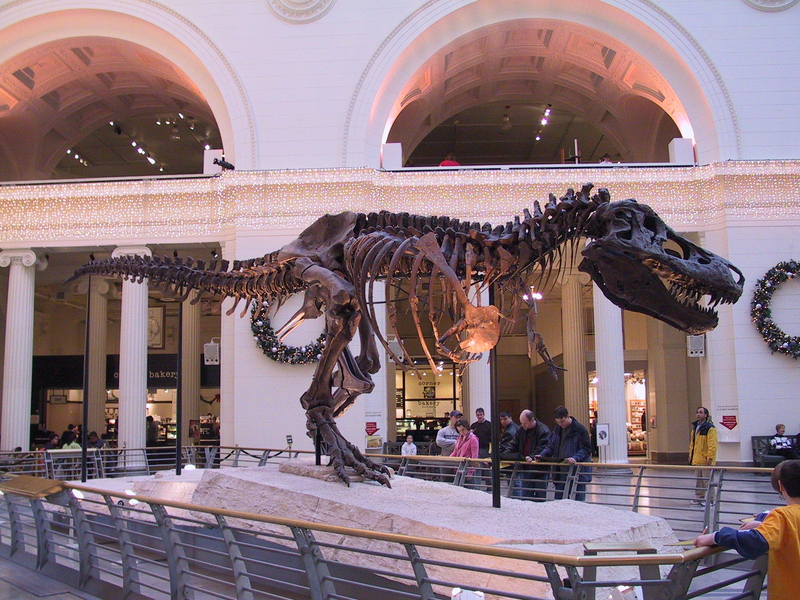 I gave it a quick once-over, particularly admiring some of the dinosaur skeletons they have on display. I must admit, however, that I was more interested in seeing the Rose Planetarium, which is connected to the natural history museum. 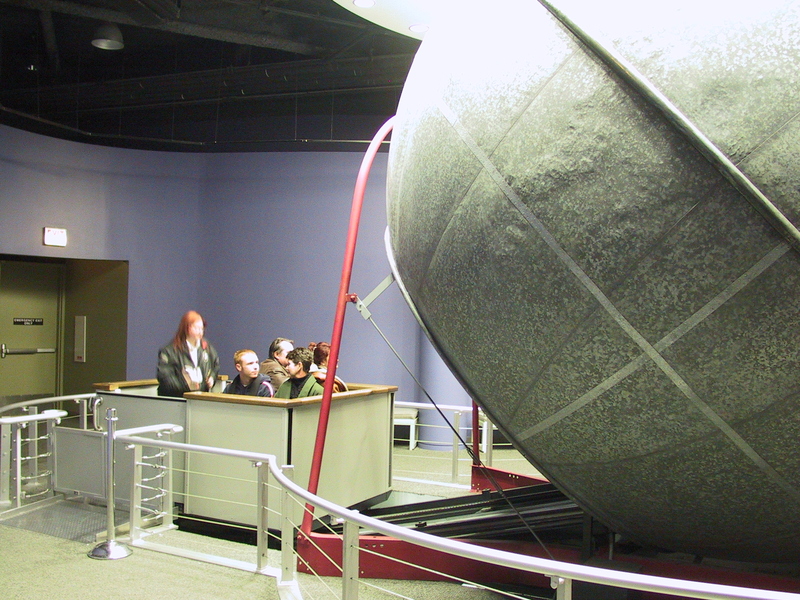 This planetarium’s Hall of Planet Earth is tremendous: it covers the geologic history of our planet and goes in-depth on the forces that shape it. The planetarium also has some magnificent photographs of our astronauts on the moon, and they show a series of films and sky shows in the planetarium dome. You could spend a lot of time here, as I did, and still not see everything that they have to offer. Obviously, I highly recommend this combined museum. Even if you aren’t all that interested in space or in natural history, the building is worth checking out for its architecture alone. 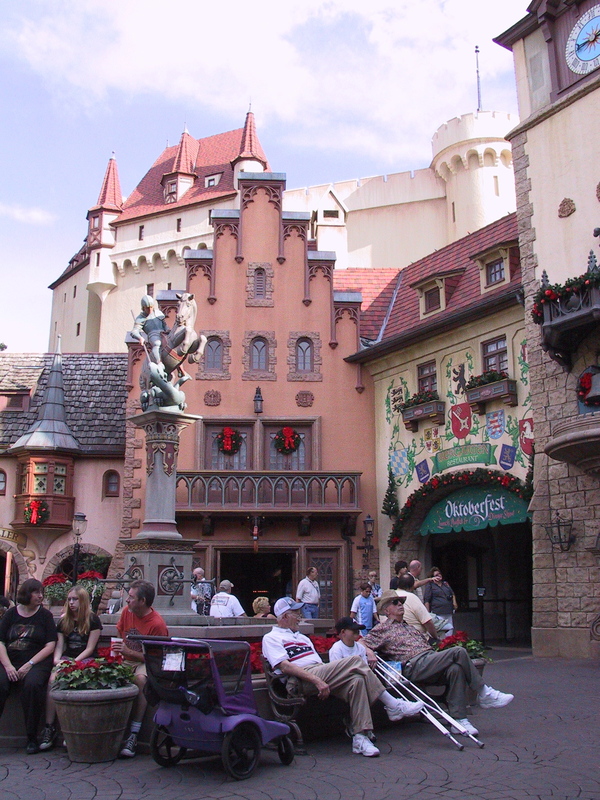 Built like a castle, with turrets and towers, this four-square-block building is made of red brick and pink sandstone. Quite an impressive sight in a city that is known for some pretty impressive buildings. On the subject of impressive—or, at least, famous—buildings, my next stop was just a couple of blocks down along Central Park West (the street that borders the park on the west side). 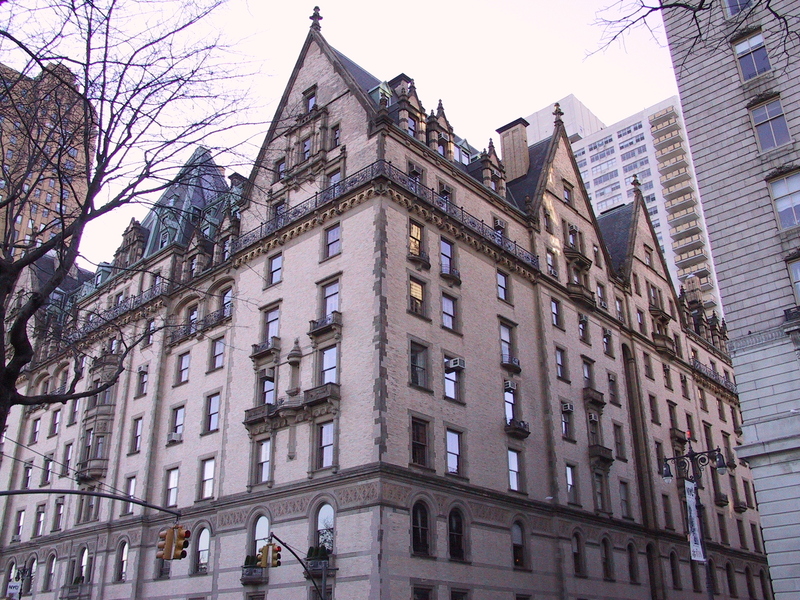 The Dakota is the apartment building where John Lennon lived, and at the entrance of which he was shot and killed. But I’ve been interested in this building for far longer; ever since I first read Jack Finney’s “Time and Again,” back in Junior High. 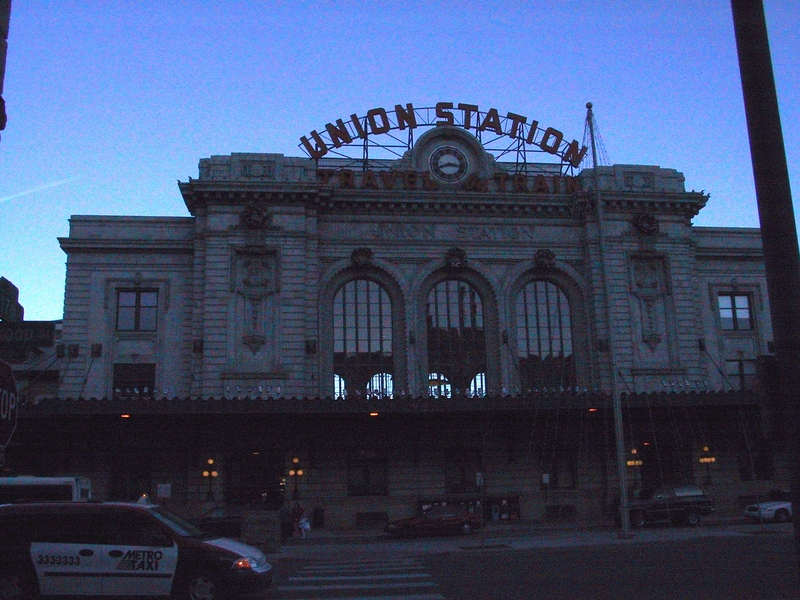 This is the building from which the protagonist, Si Morley, was able to travel in time. He could do this because the building and selected views of the city from it were—and are—virtually unchanged from when it was built in 1884. This building once sat all by itself, but as you can see from my pictures it is now surrounded on three sides by other, larger apartment buildings. Nevertheless, it is still a magnificent structure. Next stop was the Wollman Rink. 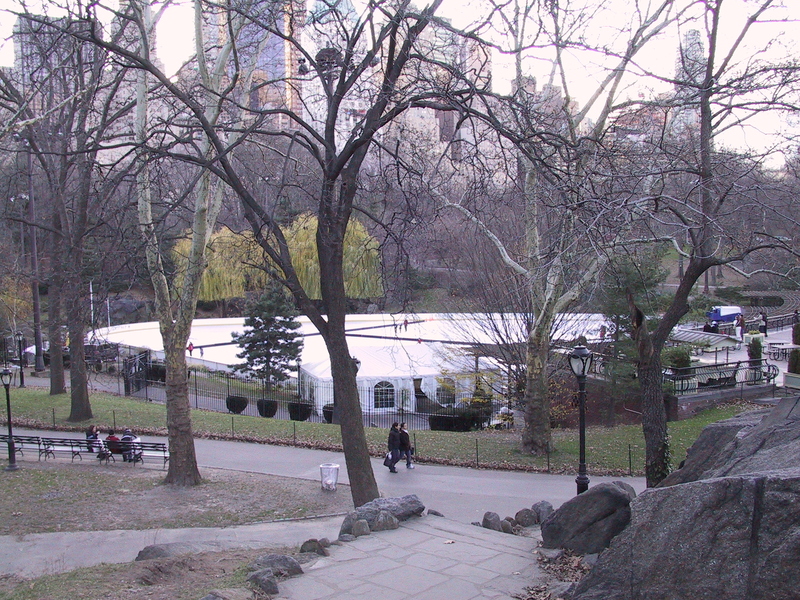 This is a year-round ice rink (during the winter, one of the swimming pools elsewhere in the park is also turned into an ice rink) near the southeast corner of the park. I had two reasons for wanting to go there: one, it gave me an excuse to walk the width of the park, and two, it has been used in a number of films that feature New York, and I wanted to see it for real. In particular, it played a prominent part in one of my recent favorites: “Serendipity.” This film, starring John Cusack and Kate Beckinsdale, features a number of locations in this area, and I thought it would be fun to see a couple of them. Accordingly, I saw (and took pictures of) the rink and then walked over to Serendipity, the restaurant for which the film was named. I didn’t go in, though: at 3:30 on a Monday afternoon there was a two hour wait. 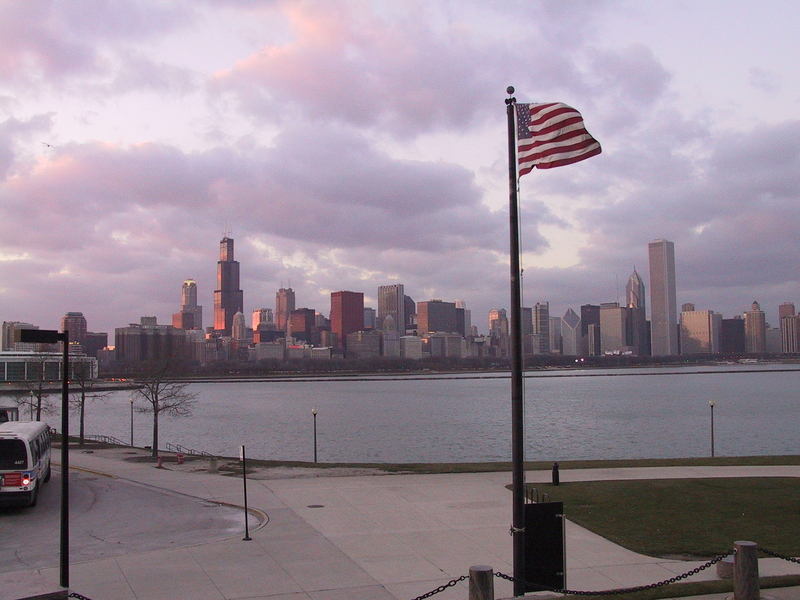 But I enjoyed seeing it, and it gave me an excuse to see a part of the city I might not have gotten to otherwise. At this point it was a simple matter to hop on the subway and travel just a couple of stops to Grand Central Terminal. 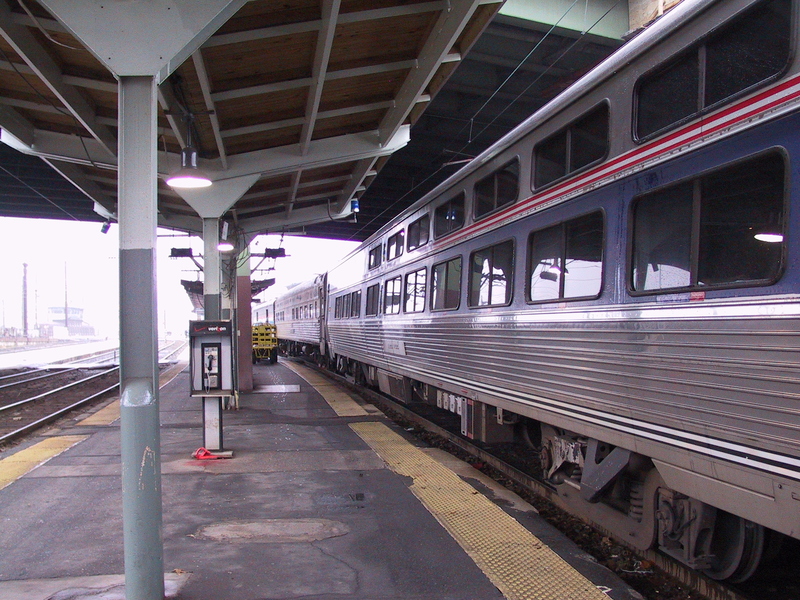 Although Amtrak doesn’t use this particular station, it serves both the subway system and the Metro-North commuter trains. Even if you don’t need the transportation services it provides, it is worth checking out the terminal itself. This is truly a magnificent building. 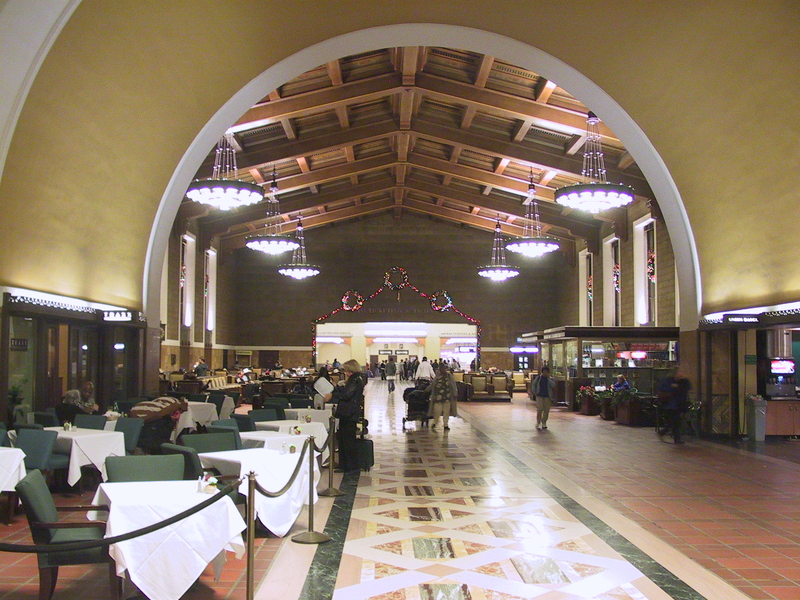 The main concourse is huge, with polished marble floors, a grand marble staircase, massive chandeliers, and a ceiling that is painted and lit to resemble the winter sky above New York. I tried to photograph it but had only limited success; the camera I had just couldn’t do it justice. You need to see this one for yourself. No visit to New York would be complete without a trip to the Empire State Building, and I did that early on. Taking my guidebook’s suggestion to heart, I had purchased a “CityPass” in advance of my trip. The CityPass is a booklet containing tickets to a number of the most popular attractions in the city. The New York CityPass includes tickets to the Museum of Modern Art (MOMA), the Natural History Museum, the Circle Line boat tour, and the Empire State Building, among other things. Because I already had my ticket, I didn’t have to wait in line to purchase a ticket to the Empire State Building. However, I did have to wait for nearly an hour just to go up there. Contrary to the impression you might get from a movie such as “Sleepless in Seattle“, you cannot just waltz right in and ride to the top. The 86th floor observatory (where you can go outside and walk the perimeter of the building) can only accommodate a limited number of people, so it takes a while before you can take your turn. Once you are up there, though, you can stay as long as you like, so take your time and enjoy the view. 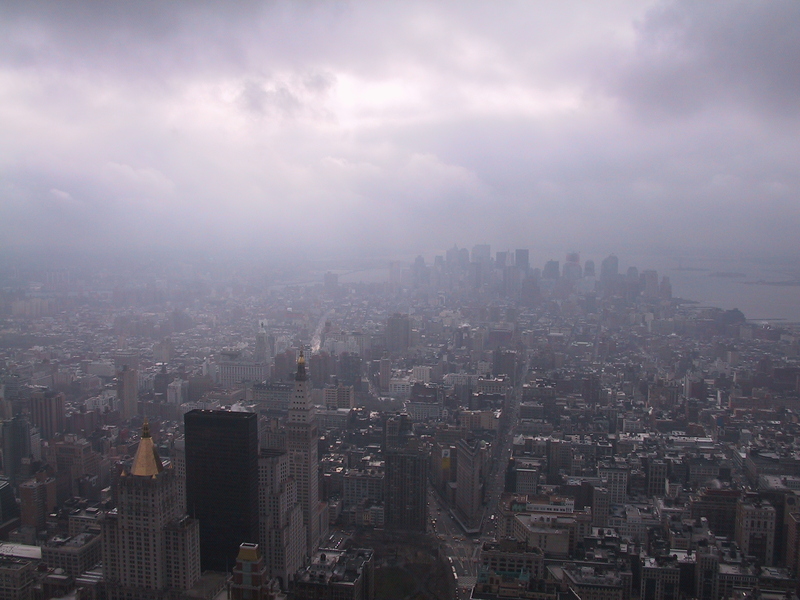 And that view was magnificent, even though as you can see from my pictures I went on a day that was pretty foggy. Fortunately, most of the haze was above me, so I was able to see everything that the audio tour pointed out. The audio tour was great, by the way. They take advantage of modern technology, giving you what is basically an iPod with a keypad so that you can easily select the different tracks that correspond to the different views from the 86th floor. No cassettes or CDs, and you can pause or repeat the audio presentation as much as you want. The narrator does a good job of pointing out the sights, even if he sounds very much like a stereotypical New Yorker. Interestingly, the guy on the audio tour of the Empire State Building had by far the thickest New York accent I heard the entire time I was in New York. And his accent wasn’t all that thick; it was akin to something you might hear on TV. I was listening for accents and was very surprised to discover that most of the people I interacted with had little or no accent at all. It wasn’t only the lack of a “New Yawk” accent that surprised me. I had a couple of preconceptions of New York that I was pleased to discover just weren’t true. For instance, the city was cleaner than I expected. Sure, you do see some papers blowing about, but nothing like I expected (I did see a rat down among the rails in the subway, though). I didn’t see nearly as much graffiti as I expected. And although there were a lot of advertisements plastered up everywhere, they were put up in a relatively neat and organized fashion. Crime? I’m sure that there is some, but I saw no actual evidence of any, even in the subways. Attitude? People weren’t gruff and surly, as I might have expected, but instead were open and friendly. And it appears that New York has banned smoking in restaurants! This was a most pleasant discovery; I had expected that smoking was big here, but it seems no worse than in California. 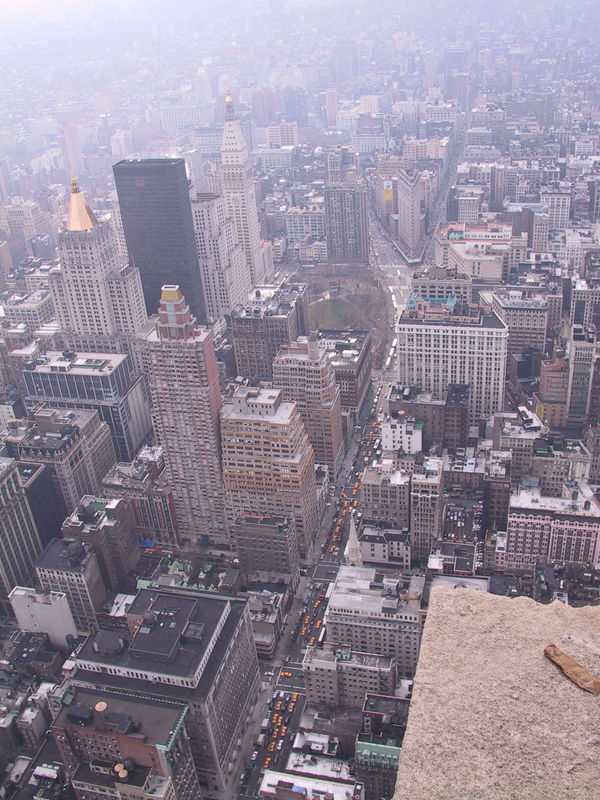 Seeing New York from the top of the Empire State Building is a great way to get oriented. Another is to take one of the Circle Line cruises around the island. Because this was included in my CityPass—and thus already paid for—I went down to the 42nd street pier and boarded the boat for the Full Island tour. This cruise takes three hours and goes all the way around Manhattan in a counterclockwise direction. 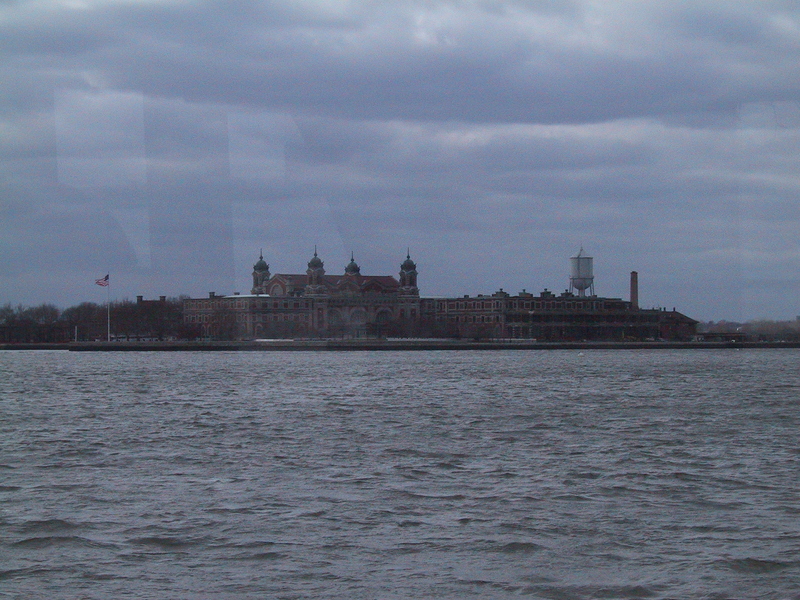 It makes a pass by—but doesn’t stop at—Ellis Island and the Statue of Liberty. The running commentary is pretty good, pointing out sights on both shores. You go under a number of famous bridges (the Brooklyn Bridge among them) and get to see many parts of Manhattan that you otherwise probably wouldn’t. 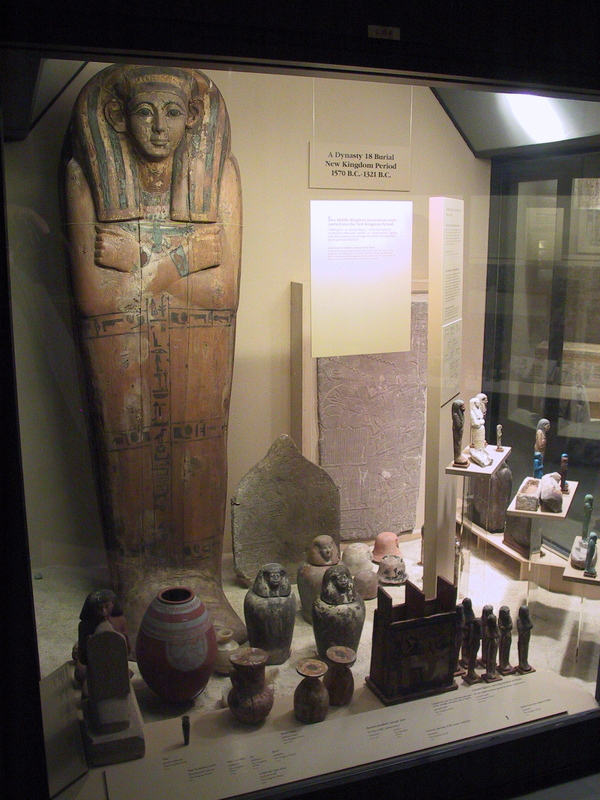 The three hour tour is the most complete, but if you don’t have quite that much time they also have shorter tours that only go part of the way around. 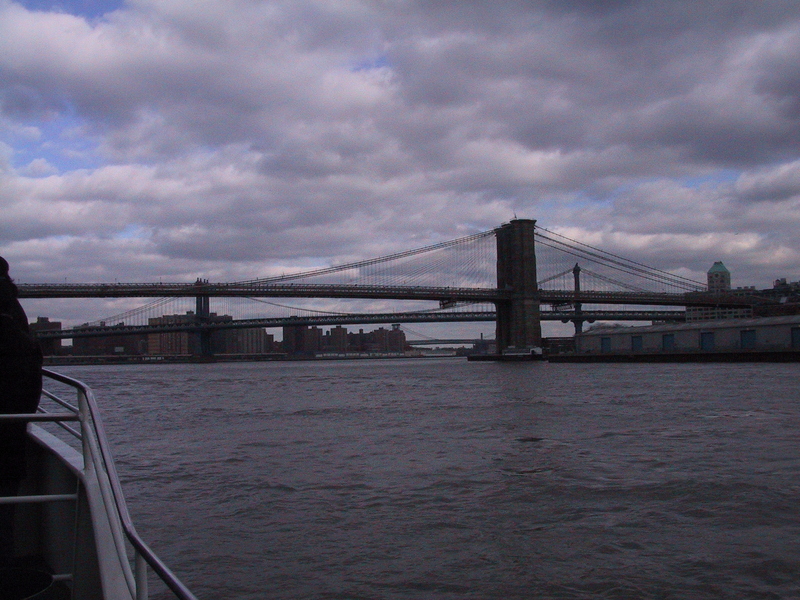 Before the cruise gets to Liberty Island and the financial district, you pass the Chelsea piers. One of these has been turned into a driving range; completely fenced in, you can drive golf balls towards the water and New Jersey. 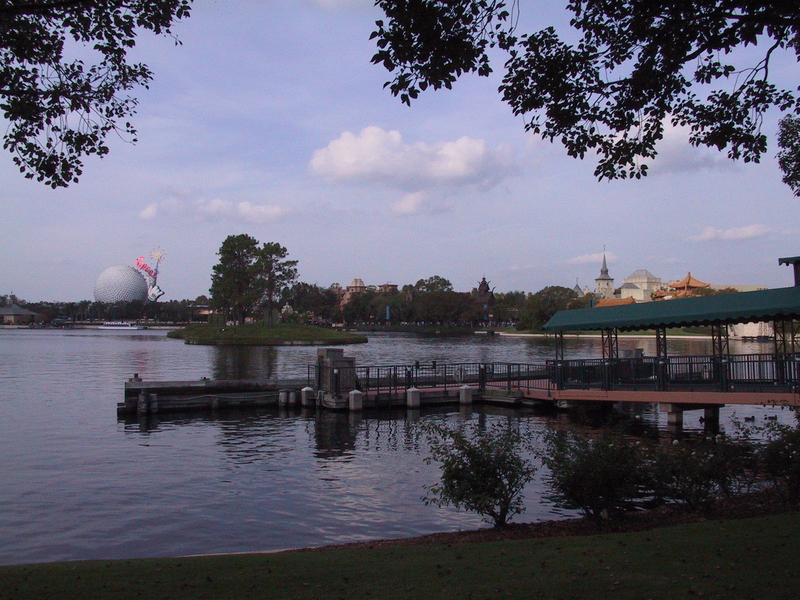 (This driving range was also featured in Serendipity). These piers deserve a historical footnote as being the place where the Titanic was supposed to tie up once it had reached New York. It’s hard to see from the water, but as you pass by the financial district your attention is directed towards the former site of the World Trade Center. The audio tour on the top of the Empire State Building also attempts to point out this location, although from that far away it is really hard to see where the buildings once stood. Fortunately, the site itself is easy to reach via subway. 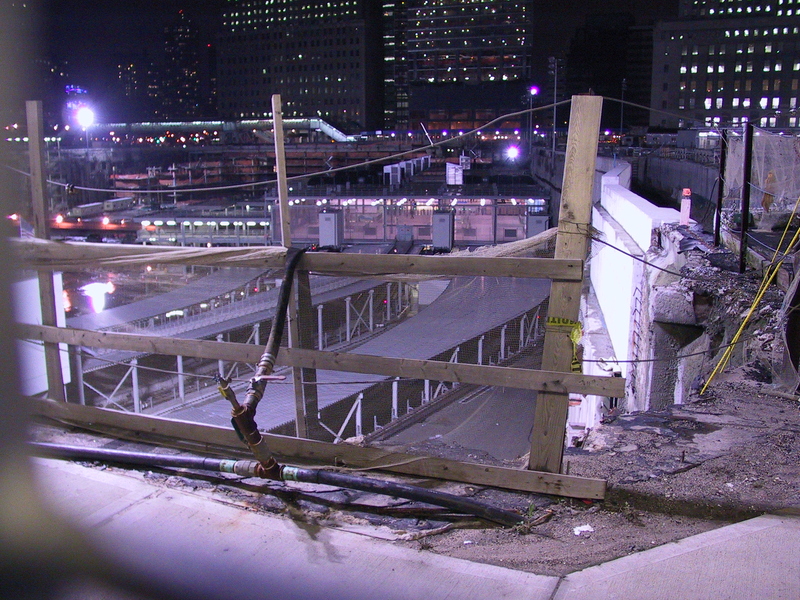 Any trip to New York should include a visit to Ground Zero. I actually went there twice. The first time was in the early evening. The site is well lit, so no matter when you go you’ll have no trouble seeing what is left. Which isn’t much, of course; by now everything has been cleared away. 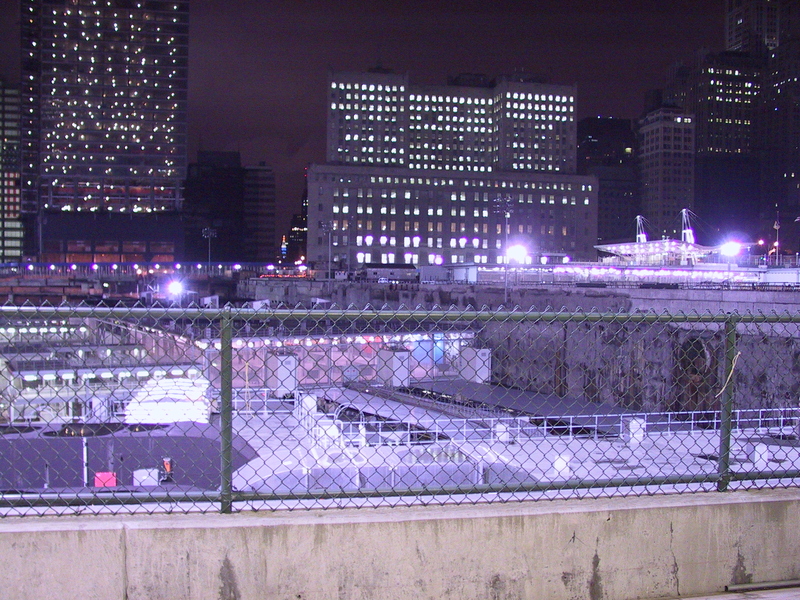 It is truly an eerie sight to look down upon the transit center that is there and realize that it was once in the basement of the World Trade Center buildings. Now it is open to the sky. It is amazing how quickly they got it running again. 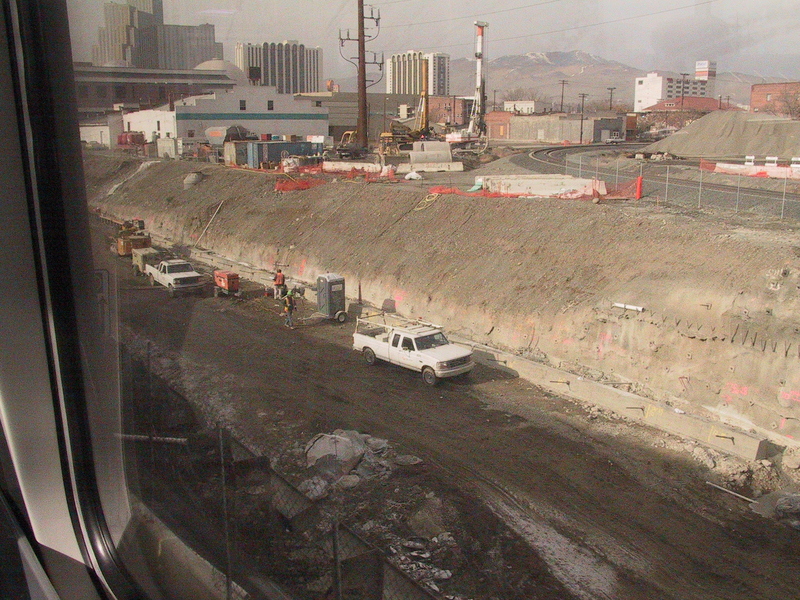 From the street, you can see trains and people coming and going; life goes on, I guess. Directly across the street from the WTC site—literally—is St. Paul’s Chapel. 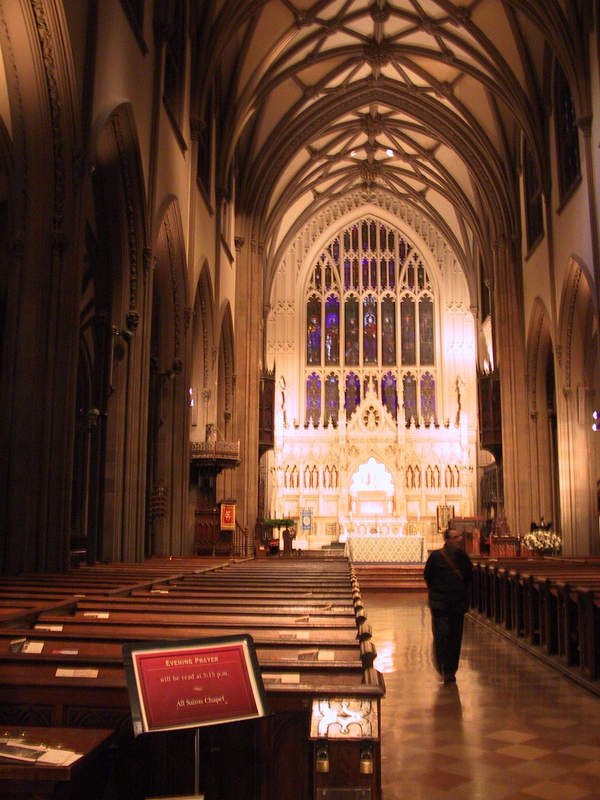 This chapel is part of Trinity Church, a couple of blocks down the street, and served as a relief center after 9/11. 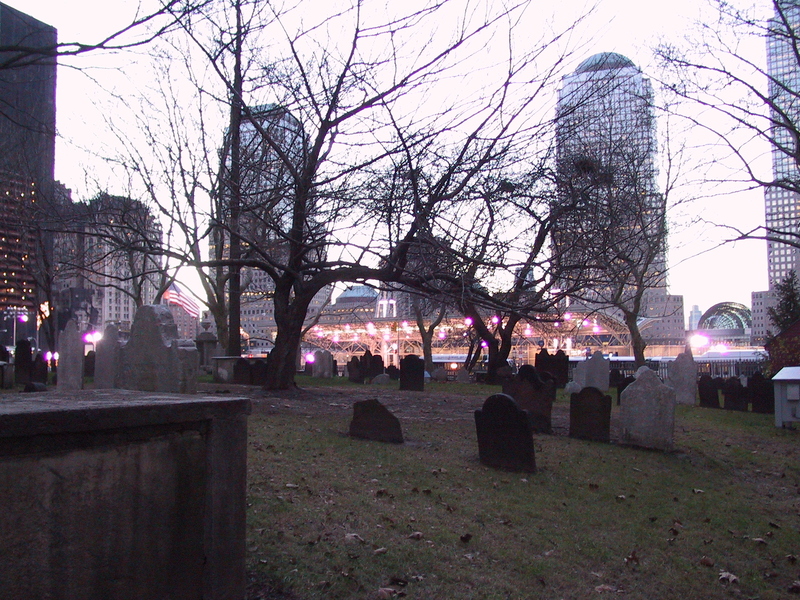 Situated between the chapel itself and the WTC site is the chapel graveyard; this struck me as an interesting bit of coincidental symbolism, so I took some pictures from the chapel, looking over the gravestones at where the World Trade Center buildings once stood. 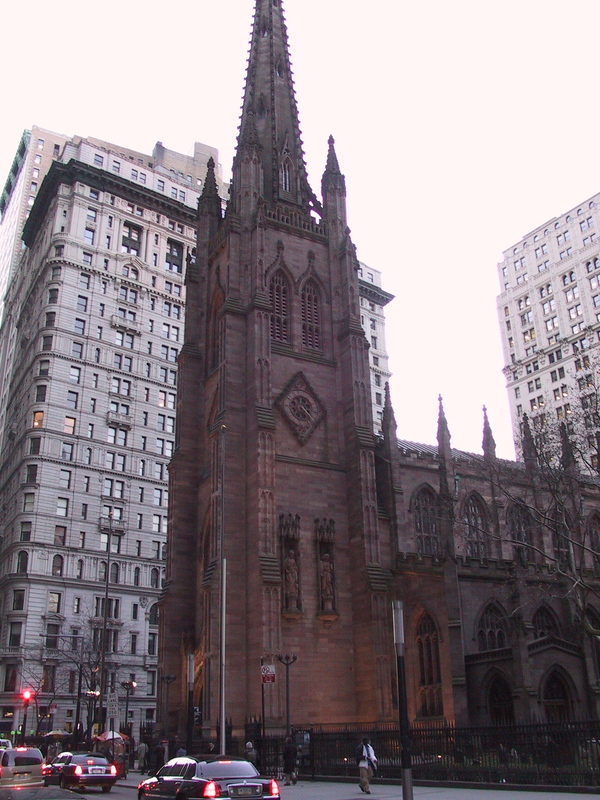 St. Paul’s Chapel is part of Trinity Church; Trinity is an historic Episcopal church. 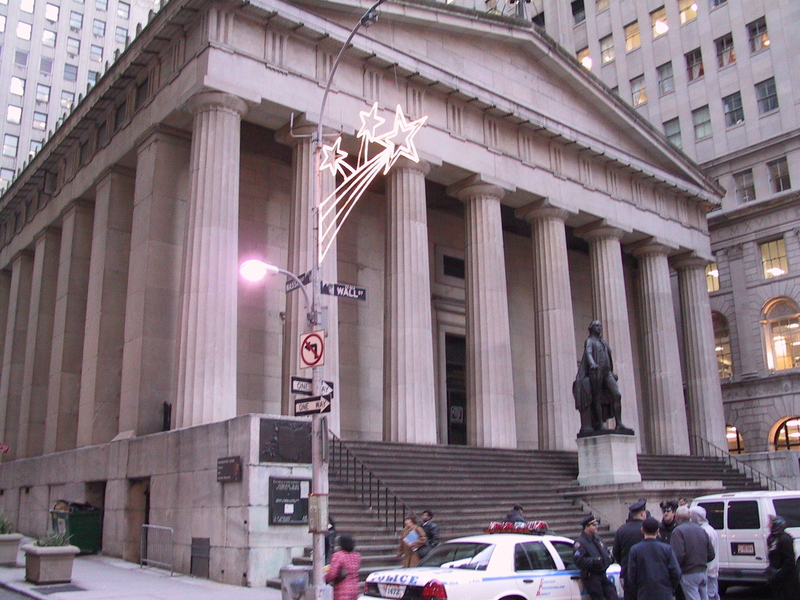 Consecrated in 1846, it sits right at the head of Wall Street. Because I believe that buildings such as this should, if possible, be seen in action, rather than take a guided tour I elected to attend a service there on Sunday morning. Not a huge church—it can seat two or three hundred people, at most—the soaring arches, intricate stone and woodwork, beautiful stained glass windows, and surprisingly good acoustics made for a very spiritual worship space. The service itself was a pretty conventional Episcopal service. If anything, it was shorter than usual and had fewer hymns—which was perfectly OK by me! Standing at the doors of Trinity Church, you are literally looking right down Wall Street to the mouth of the East River. 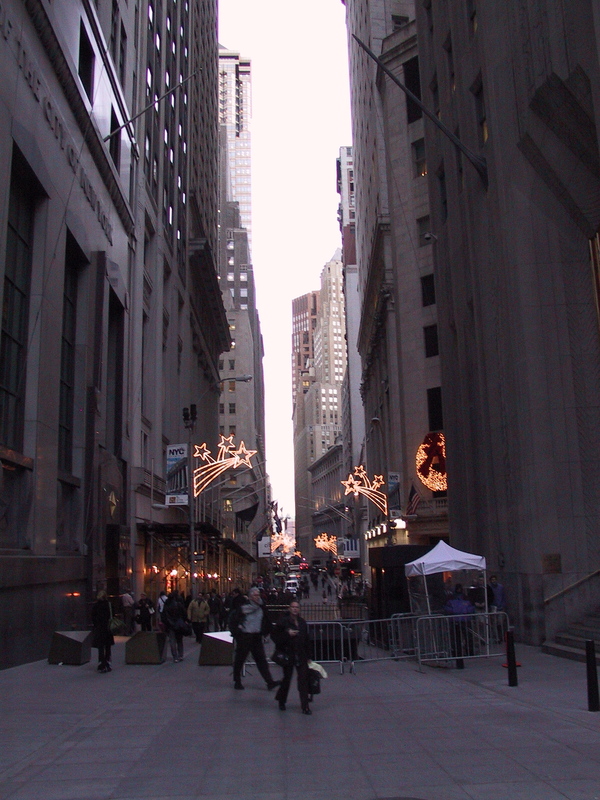 Not having seen it before, Wall Street surprised me by how small it was. It feels like an alley. For security reasons you cannot drive down it (if you ever could). 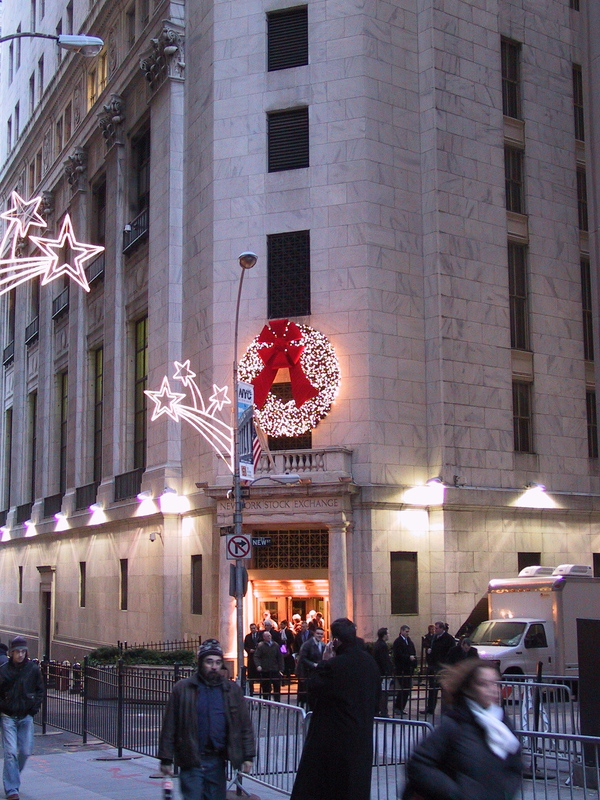 Walking down it, you quickly come to the New York Stock Exchange building, at the corner of Wall and Broad streets. Directly across the street is Federal Hall. This imposing example of Greek Revival architecture is where George Washington took his oath of office in 1789. Modern high-rises surround these historic old buildings, but, still functioning, they manage to stand proud. Manhattan is full of beautiful buildings, both old and new. Because every square inch of the island has been built upon (except for the parks, of course) in order to build a new building these days you have to tear down an old one (or two, or more). Everywhere you look there are signs of construction. And the fact that Manhattan is so tight on space means that what space there is is very expensive. This likely accounts for the high hotel prices. I was told that if it wasn’t for rent control, half the people that currently live in Manhattan wouldn’t be living there. This is some of the most expensive real estate on earth, and wealthy developers such as Donald Trump are making the most of the situation, building new, pricey living space wherever they can. Fortunately, some developers see the value in preserving old buildings; the four-story Barnes and Noble on Union Square occupies one such building. This gives the city much of its character; where out west chain stores such as Barnes and Noble and Starbucks are typically found in nondescript boxes, here they are more often than not in classic buildings that are full of character. New York is a great place to eat: there is no end of wonderful restaurants to choose from. Being by myself and having a limited wardrobe restricted my choices somewhat, but I nevertheless ate well. Some of the places I was hoping to go to—Pete’s Tavern, for instance, where O. Henry wrote “Gift of the Magi”—was packed the two times I went by, so I didn’t end up there. However, I had a really nice meal at the Blue Water Grill, one of the nicer restaurants on Union Square. And of course I had to try some New York pizza, so went to John’s Pizzeria, apparently a New York institution. It was great, and was one of the places where being a single diner worked to my advantage; while others had to wait 30-60 minutes for their tables, I was in and seated in about five minutes. Seated between two large groups, I was amused to notice that the group I was facing included John Pankow, who played Paul Reiser’s brother on the TV series “Mad About You.” As best as I could tell, he was dining with friends and members of his extended family; one of the guys had to have been his brother, by the looks of him. As I said before, there are a great many things to see and do here in New York. 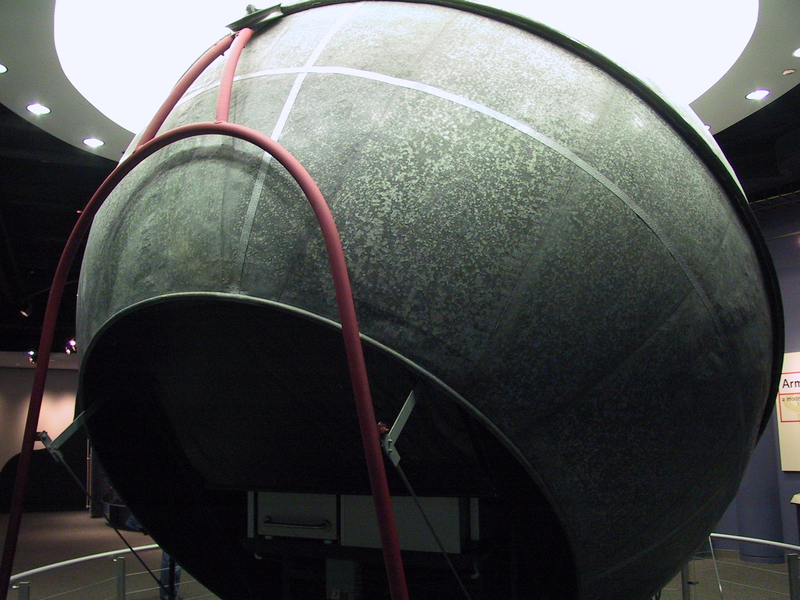 Just north of the Circle Line’s pier you’ll find the Intrepid Sea-Air-Space museum. The Intrepid is a retired aircraft carrier that saw active duty in three wars and was hit four times by Japanese kamikaze planes. 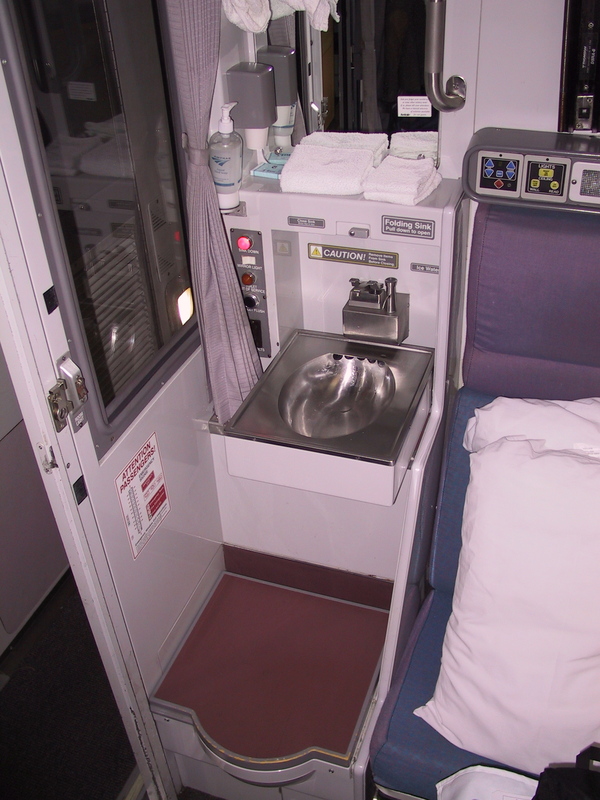 It is a reasonably good tour, made all the more interesting by a companion tour: parked right next to the carrier and free to tour with your paid admission is the Concorde “Alpha-Delta,” the last Concorde to ever touch down in New York. Inside the aircraft carrier is a really nice large-screen theater that shows, among other things, a film about how they preserved the Concorde and barged it to its current location. You can walk through the plane, as I was happy to be able to do; this may be the closest I ever get to flying in a supersonic aircraft. 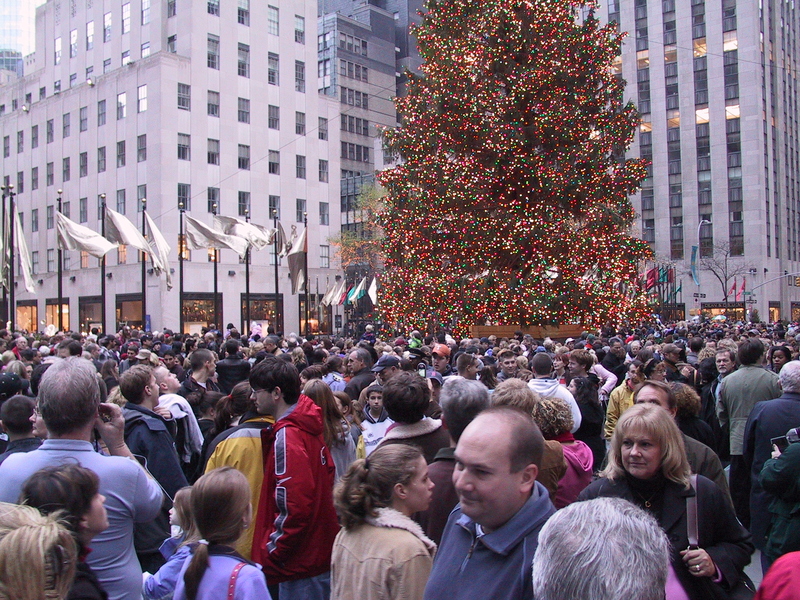 Rockefeller Center was the second-most crowded location I encountered in New York (after Times Square). It probably would have been the most crowded had I managed to get there when they were filming the Today show. 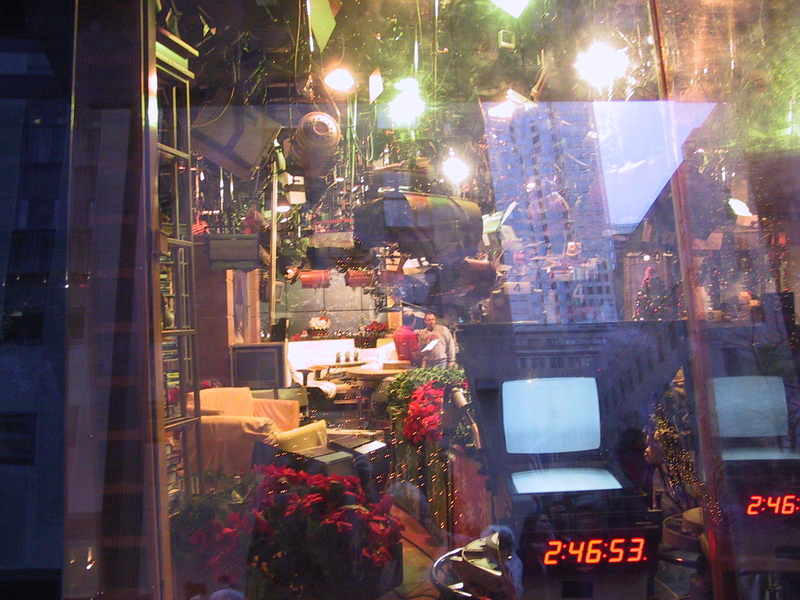 As it was, I contented myself with a look at the ice rink, the Christmas tree, and the Today show set, being prepped for the next day’s show. Given the crowds, I didn’t linger. Another of my CityPass tickets got me into MOMA, the Museum of Modern Art. This six-story building had just reopened after extensive renovations, apparently, so I figured it should be something to see. But I have to say that I was pretty unimpressed. Of course, I don’t know what it looked like before, so perhaps in comparison the new MOMA is a vast improvement. It certainly seemed like a good enough place to showcase modern art; its just that I quickly came to realize that I don’t care all that much for most modern art. The one exhibit I actually liked was showcasing well-designed everyday objects. Chairs, lamps, toasters, even a car and a motorcycle were on display. I was very pleased to note that Apple was well represented: among the examples of good design were an iPod, an iBook (the laptop computer I’m using to write this), the spherical speakers first introduced with the Cube computer, and an iSub speaker. This exhibit was one I could relate to; the others were beyond me, I’m afraid. And perhaps the building itself falls into this same category; if you are more appreciative of modern art—or architecture—than I, this museum may well be worth seeing. Myself, I’ll skip it next time. I had expected to see snow this time of year, but I was pleased that the only “weather” I had was on the day I arrived, when it drizzled a bit. Not so much that I needed an umbrella, really; an overcoat was enough to keep me comfortable and probably helped me to blend in a bit: I saw lots of people wearing overcoats (and scarves; I didn’t bring one of those). The next day, Saturday, was cloudy, but by that afternoon it had cleared and for the rest of my time in New York the skies were clear and sunny. Clear but cold, of course; the thermometer never made it above the mid 40’s while I was there, and at night it dropped to well below freezing. But cold I was prepared for. And, of course, I was inside a lot. The subway system stays nice and warm, too. 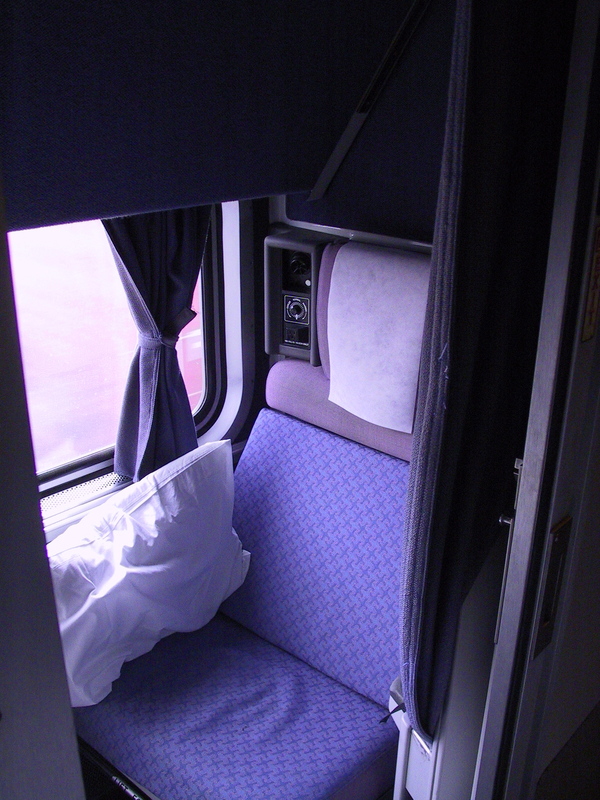 When it was time to leave New York, I checked out of my room but left my suitcase in the care of the hotel; my train wasn’t due to leave until almost 3:00. I spent my morning—and a bit of my afternoon—at Starbucks, sending my previous article and surfing the Internet. By about 1:00 I figured I should get going, so I returned to the hotel, retrieved my suitcase, and descended into the depths of the New York subway system one last time. 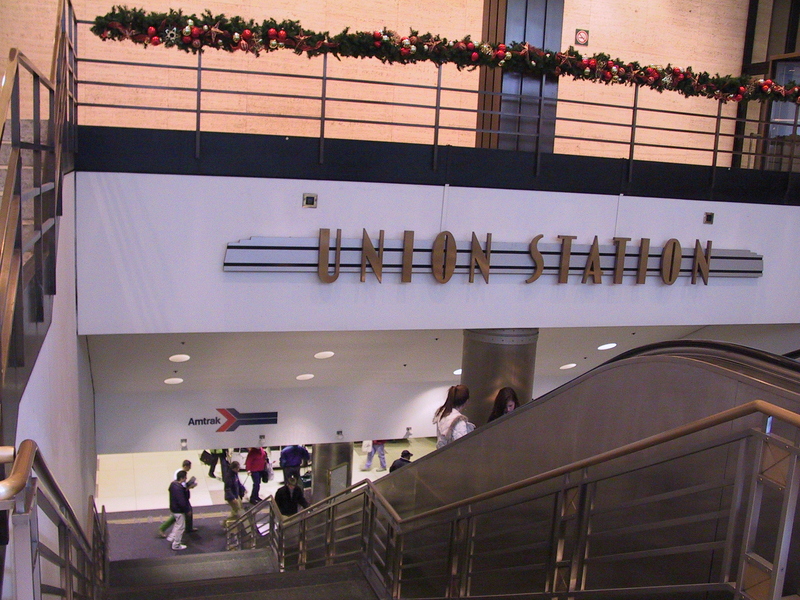 Two short subway rides later, I was climbing the stairs into the heart of Penn Station. My train was on time, and I was early. I took the opportunity to consume one last slice of New York pizza, and then I headed off to “Club Acela,” the special lounge for first-class Amtrak passengers. 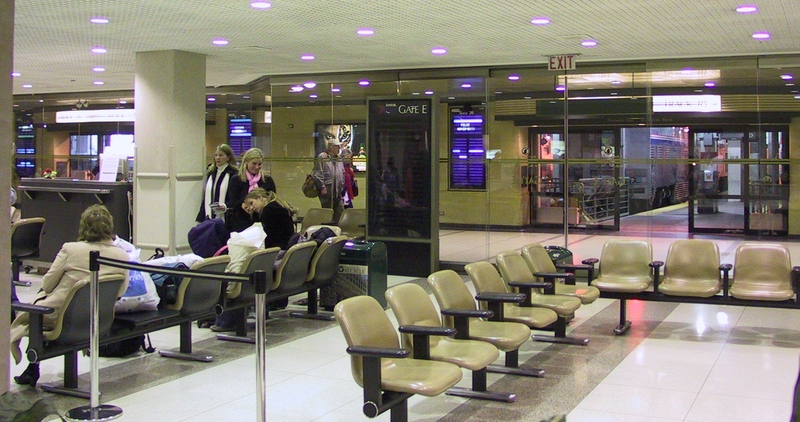 Like a first-class airline lounge, this is a secluded area where waiting passengers can enjoy free coffee and soft drinks, read the day’s newspapers, and watch CNN in comfort and quiet (well, relatively quiet; people on cell phones are getting more obnoxious all the time). 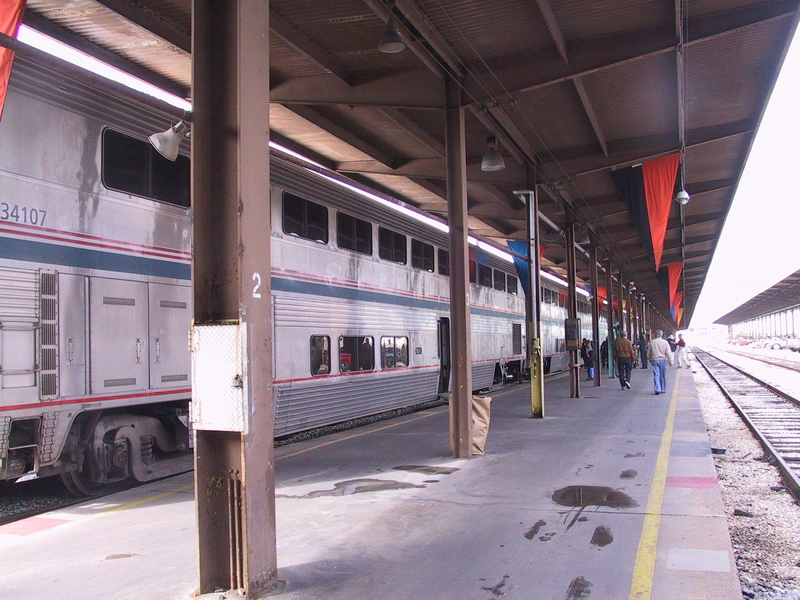 Upon entering the club, you present your train ticket; they then call you when it is time to board your train. As I waited for my boarding announcement, I felt very sophisticated as I sipped my iced tea and read through the Financial Times. I felt very much at home; so comfortable, in fact, that I wasn’t all surprised to look up and see none other than Bill Cosby enter the room. He looked as if he knew the place well. He smiled, waved to one or two folks, and headed off towards the bathroom. Unfortunately, they called my train at that point so I had to leave before he came out. But it did make me start to wonder if some celebrities, rather than avoiding the train as a form of lower-class travel, use it because they can travel in relative anonymity. The train left right on time, and that was it for New York. I had entered the city with some trepidation, but was leaving feeling very good about the place. It isn’t the kind of place I’d ever live—the whole way of life there is just too foreign to the way I am used to living—but for the visitor it is a beautiful city with a lot to recommend it. 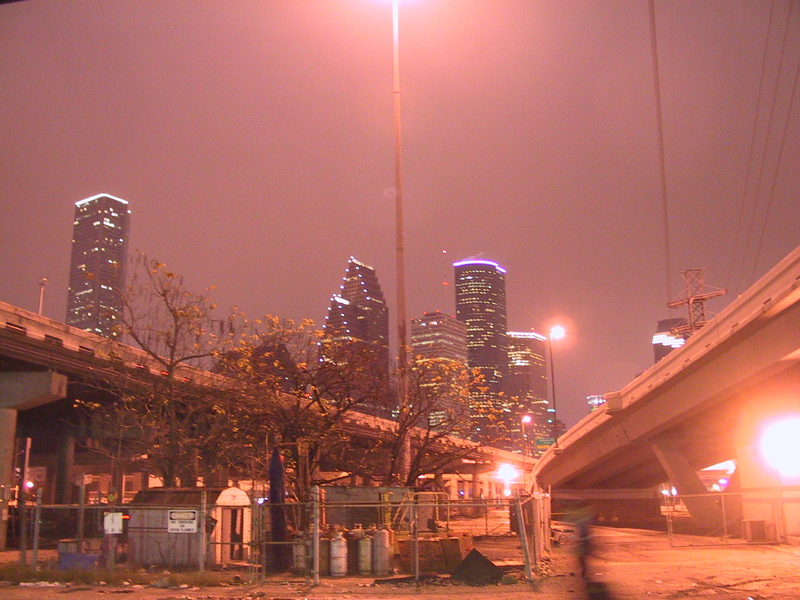 It is full of life, full of energy, and, for such a large city, clean and safe. I am looking forward to being able to take Nancy there; it is the kind of city that is best enjoyed with others. The first thing I thought of when I realized that the Sunset Limited terminates in Orlando was Disney World. Then I looked at a map of Florida and realized that there was a far more important reason for me to go to Florida: the Kennedy Space Center. The Kennedy Space Center (and Cape Canaveral – they are two different places) is an amazing place. For one thing, it sits within the Merritt Island National Wildlife Refuge. The refuge (and, by extension, the Space Center) is teeming with wildlife. Birds, turtles, alligators, snakes, armadillos, etc. are everywhere. The alligators especially love the landing strips—there is a group of alligator wranglers who’s job it is to clear the landing strip before the Shuttle can land! 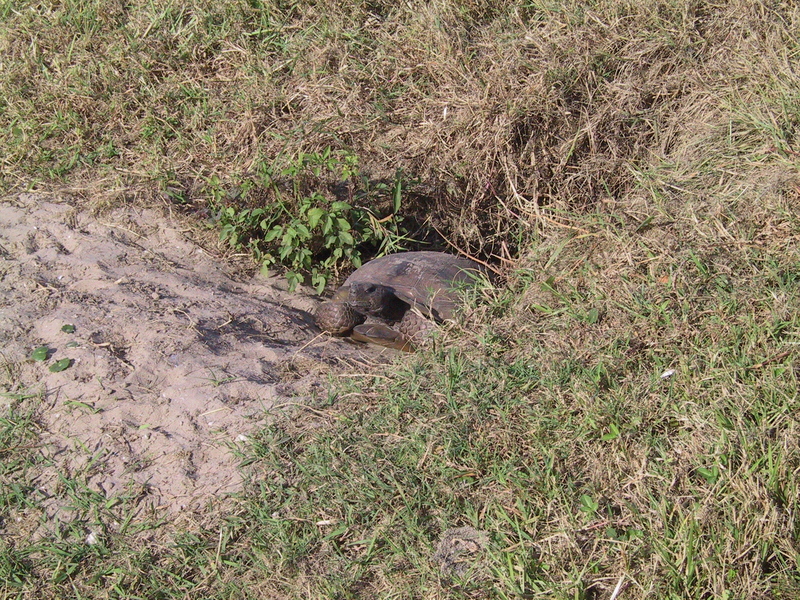 Throughout my time here I saw countless alligators, and, as you can see from the photos, turtles. Driving to the Center on the second day, I had to swerve into the opposing lane because a turtle was crossing the highway and was right in the middle of my lane. Did you catch that? “The second day.” Yes, there is so much to see here that I had to come back for a second day. Fortunately, the entrance tickets are good for two days (with validation). You could probably cram it all into one day, but I took both of the extended tours that they offer, and each are more than two hours long. That, plus exploring the Kennedy Space Center Visitor’s Center (with two IMAX theaters, a large number of other exhibits, and the “worlds largest space shop”) is tough to jam into a single day. Back to the Space Center. Basic admission gets you into the Visitor’s Center complex. 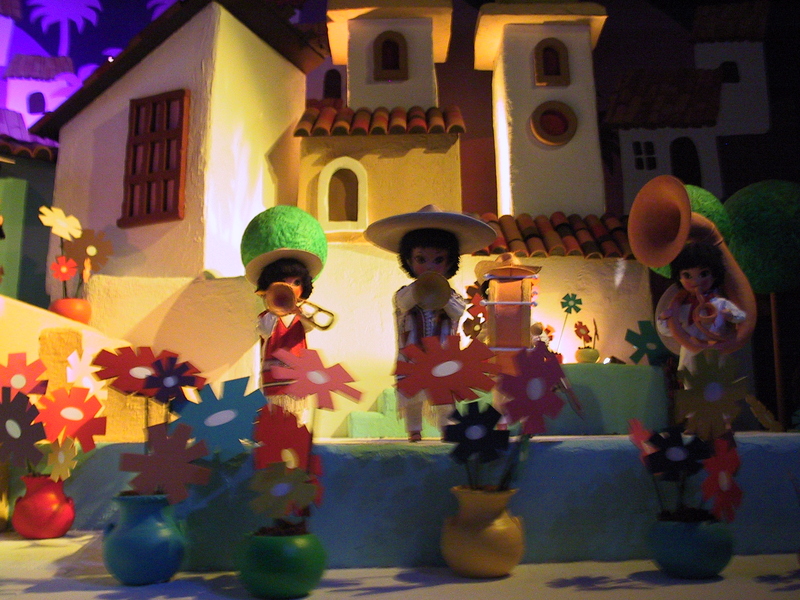 They have a number of movies, interactive exhibits, and the like. A couple of times each day they have an astronaut give a live talk where you can ask questions. You can wander the rocket garden, explore the full-size Shuttle mockup, and, of course, shop in the “worlds’s largest space shop.” It’s a pretty good shop—they have a ton of space-related stuff, from kid’s toys to shirts and jackets to pins and postcards to books and expensive artwork. Your basic admission also gets you on a bus out to see pad 39A and B (the twin pads used to launch all of the moon missions starting with Apollo 8, and all of the Shuttle missions), and the Apollo/Saturn V Center. The Center is neat: they have one of the three remaining Apollo rockets. The one here at Kennedy was supposed to be Apollo 19, but funding cuts prevented it from ever being launched. They also have a moon rock that you can actually touch. That’s the basic tour. Pretty much self-guided, plus a couple of videos played while you are on the bus out to the Apollo/Saturn V Center. If you are willing to pony up some extra $$$, however, there are two other tours you can take that give you a more in-depth experience. The first is the “NASA Up Close” tour (see the photos at [deleted]—pretty much all of these are from that tour). I did this one the first day. They take you out on a bus with a real live guide, so you can ask questions. They go all around the Kennedy Space Center, which is where the NASA missions take place: the moon shots and the Shuttle missions, mostly. We first went into the building where the International Space Station modules are processed. This is truly an international effort: there were six or so modules in there, three of them from Italy and one from Japan. The modules are brought here from their countries of origin and then tested prior to launch. As you can guess, with the Shuttle flights temporarily halted, the modules have been stacking up a bit… The Shuttles are scheduled to resume flying in May 2005 (hopefully) so we should get the Space Station project moving again. 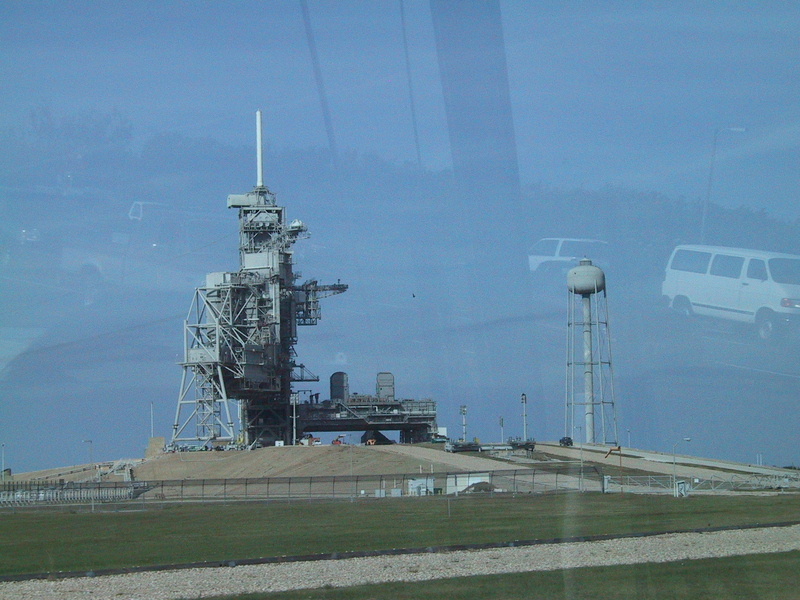 The Up Close tour then takes you out to 89A and B (the launch pads used for the Apollo and Space Shuttle missions). You don’t actually get right up to the pads, but you get much closer than the regular tours. 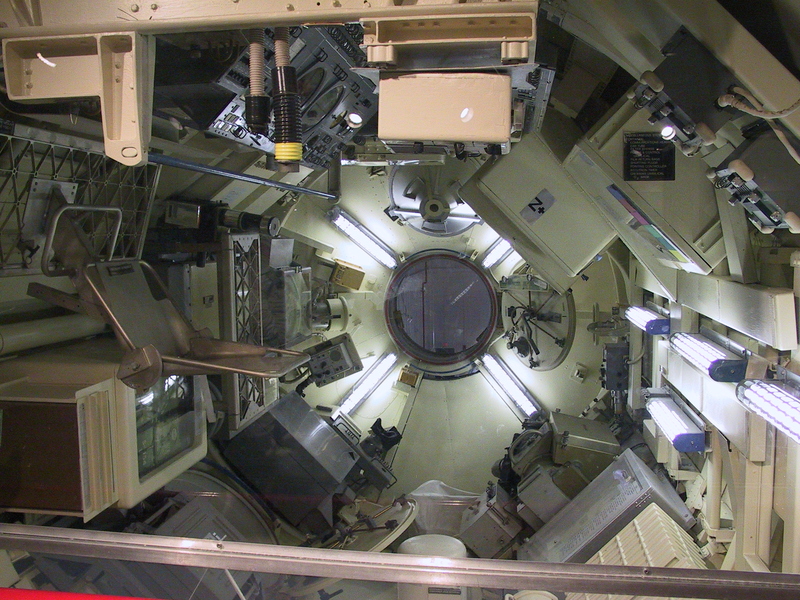 You get to go out to where the closest cameras are mounted—automatic cameras, since this point is far closer than humans are allowed to be when the rockets are launched. We walked around there for a bit, and then we went out to the Shuttle landing strip. They say that this is the longest landing strip in the world—three miles long. It’s just a landing strip, not much to look at. But apparently the alligators just love it. They actually have people who’s job it is to go out on the runway prior to a landing and chase the alligators off! Once the Shuttle has landed, they tow it off the runway and right down the middle of an extra-wide street (temporarily blocked off, of course) to the Shuttle’s hangar. We drove down that street, and right by the three hangars where the three flyable Shuttles currently are. 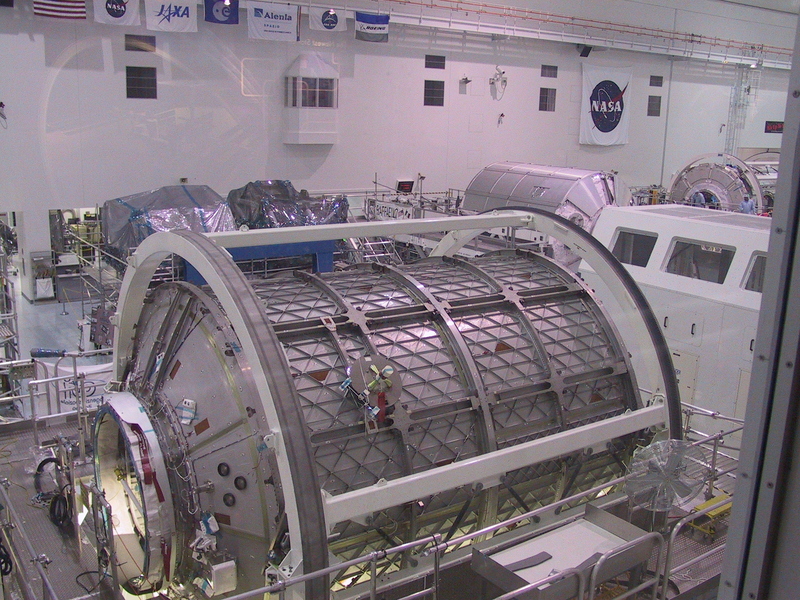 Discovery, one of the Shuttles, is there in its hangar, actively being prepped for launching in May. 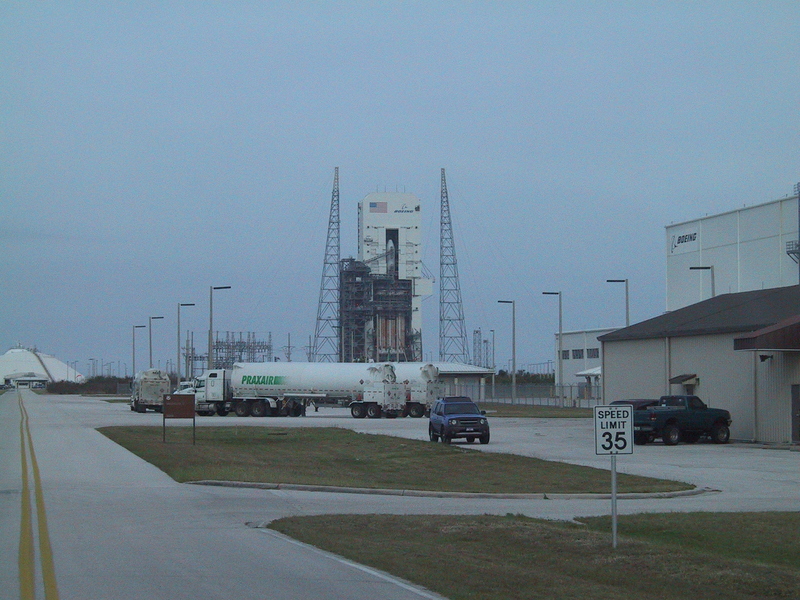 The Shuttle hangars are close to the Vehicle Assembly Building (VAB), which most folks have at least seen pictures of. Tourists aren’t allowed inside, unfortunately, but even from the outside this is a pretty impressive building. They claim that by volume it is the largest building in the world. This is where the Shuttle is put together (what most people think of as the Shuttle is just the orbiter; the Shuttle is the orbiter plus the large external fuel tank plus the two solid rocket boosters; see my mockup photos for the various pieces). They start by bringing the launch platform in. Then they place the two solid rocket boosters in their proper positions. Next, they drop the external fuel tank between the two boosters, and fasten them together. Finally, they bring in the orbiter and attach it to the external fuel tank. The whole process takes about two weeks. Finally, when it is all ready, one of the crawlers comes in, slips underneath the plaform, raises up and then trundles off to the launch pad. The crawler moves along at the blazing speed of 9/10 miles per hour. 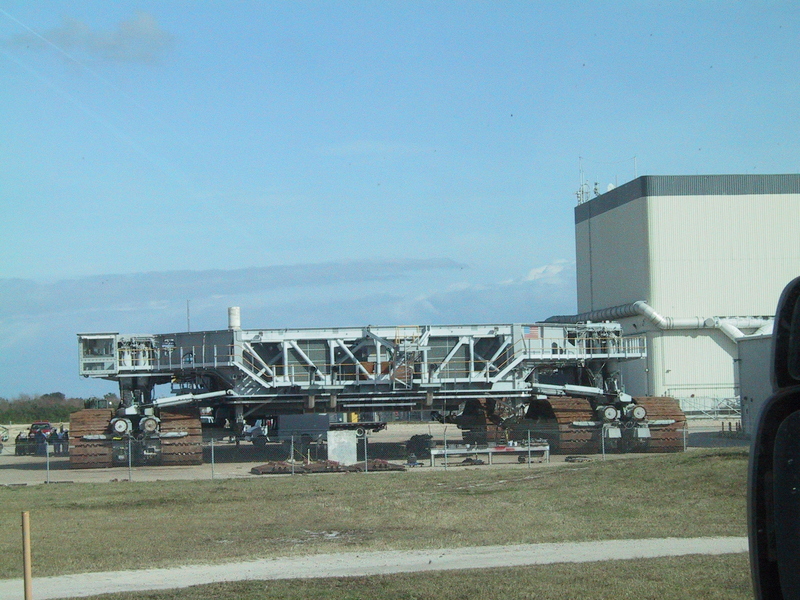 The pad is three miles away, so it takes a while to move the assembly out there. One of the things I found interesting about the launch pads was the water tower off to the side. I knew that there was a lot of water involved in the launch (I’ve never noticed the tower, though, where the water is stored prior to the launch), but I always thought that they shot it into the space below the platform to keep things cool. They do shoot it into the space below the platform—a lot of water, in a very short time—but it isn’t for cooling. It actually acts as a noise suppressor, and is necessary because the rockets are so loud that at full volume the sound would actually shake tiles off of the Shuttle! It’s amazing some of the solutions they had to come up with make these things fly. 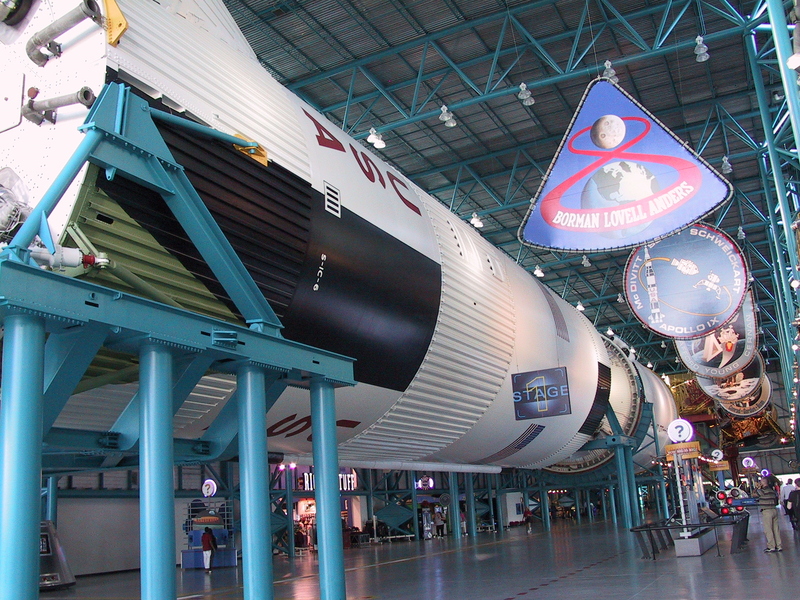 The Up Close tour—and the “Cape Then and Now” tour, too—ends up at the Apollo/Saturn V Center, so if you take either of these tours you don’t need to take the regular tour as well. You aren’t missing anything. I spent most of my first day on the Up Close tour and exploring the Apollo/Saturn V center. I made it to one of the IMAX movies, but didn’t get to much of the rest of the visitor’s center. While I wouldn’t have come back just for the visitor’s center, I was interested in the “Cape Then and Now” tour, and so decided to come back for another round of space stuff. 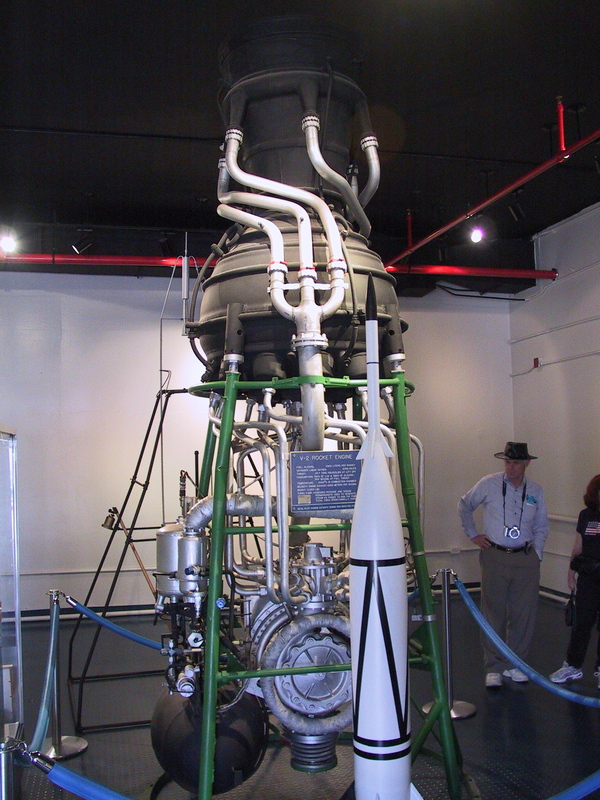 The Cape Then and Now tour focuses on Cape Canaveral. Many people confuse Cape Canaveral (for a while named Cape Kennedy, but the name has been changed back) and the Kennedy Space Center. The two are adjacent, but distinct places. 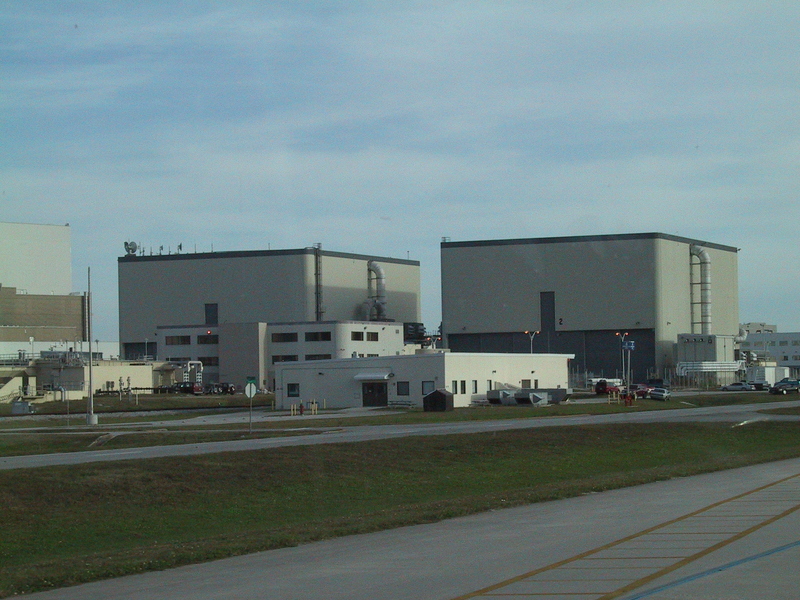 Cape Canaveral is the military facility where the early launches took place. Kennedy Space Center was built for the moon launches; this is where all of the Saturn V launches (starting with Apollo 8) took place. Since the first tour only covered Kennedy, I only got half the story. 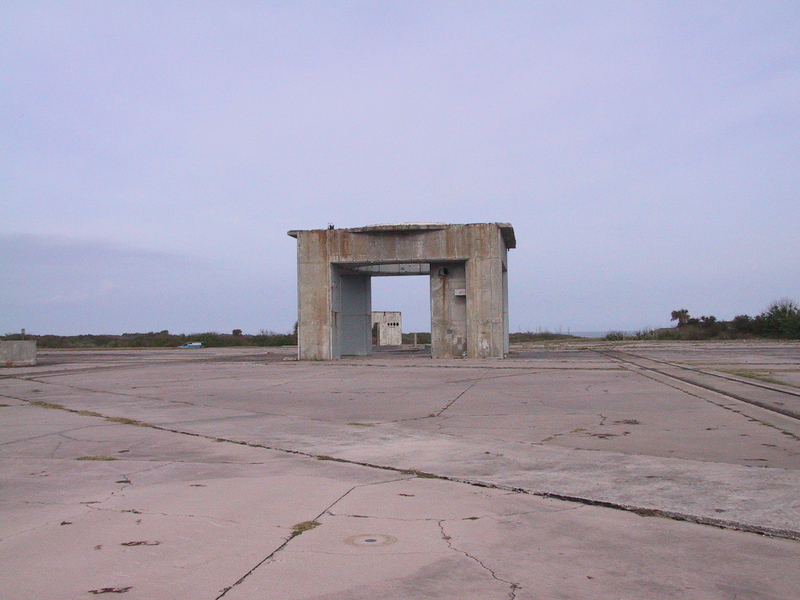 As you can see from my Cape Canaveral photos ([deleted]), the Cape is an interesting mix of historical (the Apollo 1 launch pad, the old blockhouse used for the smaller rocket launches, etc.) and current activity. They have a number of pads still in use. At this very moment, there are five rockets on launch pads all being prepped for their various missions. We couldn’t get terribly close to any of the active pads, of course. The inactive ones are a different story. 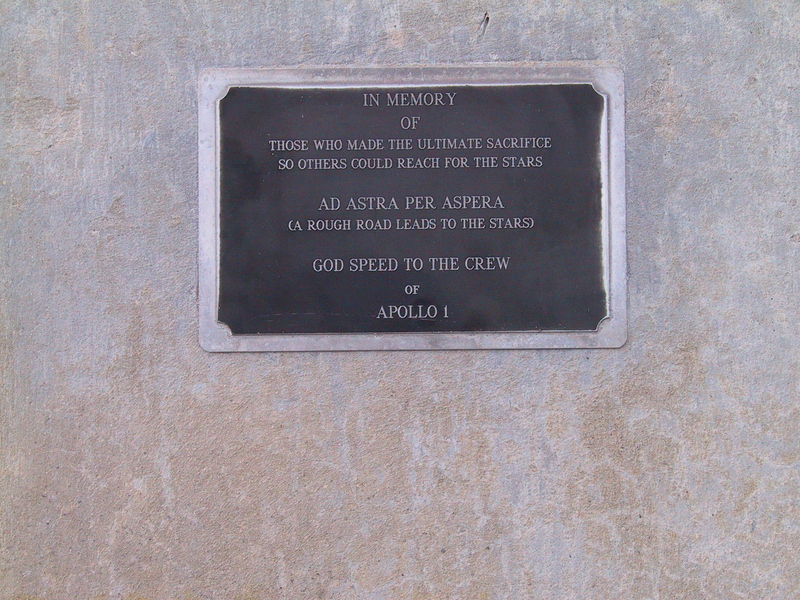 I was very pleased to see that they’ve made the Apollo 1 pad into something of a memorial to the three astronauts who died there during a pre-launch test. There isn’t much in the way of a memorial—just some benches in their memory, and a kiosk describing the event (that isn’t in my photos because the recent hurricanes blew it into the bushes; they have yet to put it back in place). But it doesn’t need much. As they are, the concrete structure upon which the rocket rested, the scorched fire bricks that show the evidence of various launches, and the general air of peace and tranquility seem fitting somehow. This second tour also ended up at the Apollo/Saturn V center (they’re proud of it, as they should be); I didn’t spend much time there since I had already explored it. Instead, I headed back to the Visitor’s Center and spent the rest of my afternoon exploring that more thoroughly. 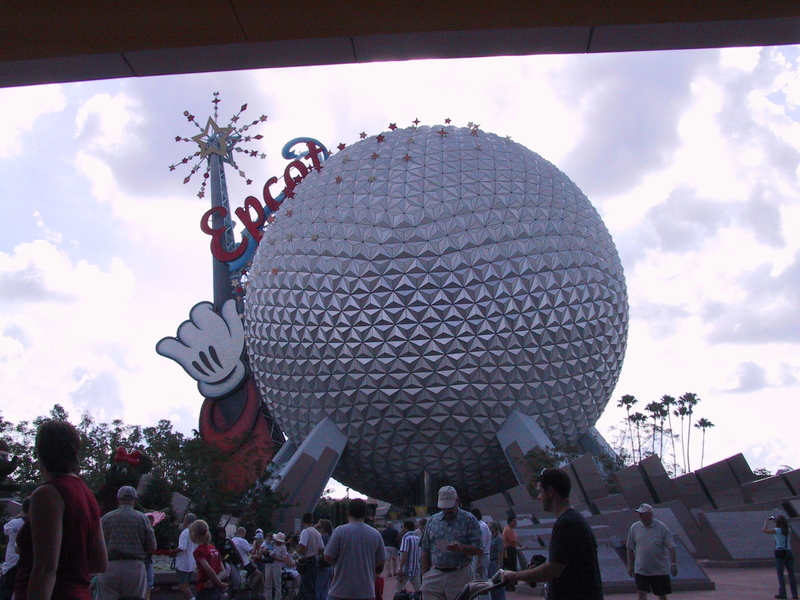 The Kennedy Space Center complex is a 45 minute drive from the center of the Florida Disney universe, so if you are planning a trip to Disney World you should consider spending at least one day out at Kennedy, learning about our space program. I’ve always been a huge fan of the program (can you tell?) and of course I enjoyed it immensely. But if you aren’t all that familiar with the history and current status of our activities in space, do yourself a favor and check it out. I’ve always believed that space exploration is our destiny; it’s something that we really need to do as human beings (well, exploration in general—but we’ve explored just about all of the land on earth, so that only leaves the oceans and outer space). Unless we push on to explore further outside our environs, as humans we’re just marking time. And the huge number of technological advances that have come out of our space program (all paid for at taxpayer’s expense, true, but then all made freely available to the public; NASA by law cannot patent any of their inventions and cannot collect royalties on anything) have, I belive, more than repaid us for what we spent. Continued exploration of space means that we’d be having to face and deal with new challenges. Overcoming those challenges will benefit us all. Space may well be the “final frontier.” So what are we waiting for? Let’s get out there!